Once upon a time in Sanya, Hainan – Miss World, banished bureaucrats, spas, dog hotels, hot springs, pineapples, and some fine rocks. A Sanya fun guide to the best Yalong Bay child-friendly resorts and a look at Haitang Bay MICE resorts. AND THERE in the hotel lobby, while a merciless sun beat down outside and the heavy, damp air turned wetter than a dog's tongue till we felt we were enveloped in suffocating warm jelly, there was this one solitary schmuck. Amidst the bikinis and white shorts and tanning bodies, he stood out, bedraggled and sweating, in a suit and tie. Now what kind of chucklehead wears a tie at a beach resort? I shook my head in disgust. Then as I passed a mirror, I stopped to adjust my tie, wiped off the sweat coursing down my face, and stepped out into the midday sun, clutching my briefcase and cameras. Behind the scenes, this is how the "romantic" endeavour of putting together a Sanya resorts review is accomplished. Despite my garb, people everywhere smiled welcomingly and spoke to me like an old friend, in Russian. At night I watched thundering fireworks. These were for people called MICE and they were all clearly having a good time. MICE is an acronym for meetings, incentives, conferences and exhibitions. With so many corporate MICE groups in town hotels often compete with each other to set off the biggest, brightest, noisiest fireworks with the result that by around 8pm guests will have assumed it is the end of the world and shall be racing about like headless chickens. Don’t pooh-pooh this. Scrambling around aimlessly on an empty beach at night is pretty much the highlight of a Sanya family holiday unless you happen to be staying at one of those Sanya conference hotels armed with greater pyrotechnic muscle, in which case you’ll do the same on a more well-lit beach. 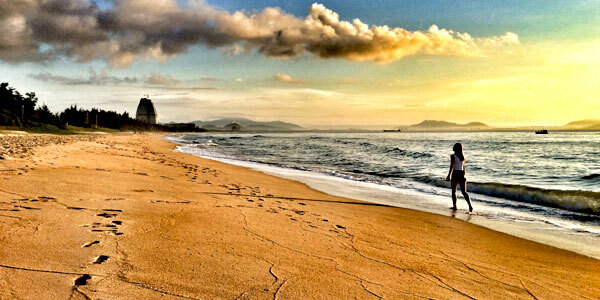 Welcome to Sanya, the “Hawaii of the East”. No longer content to bask in reflected glory, this sleepy backwater has awoken and reinvented itself as “Forever Tropical Paradise – Sanya”. This island – or, more accurately, one corner of an island, Sanya and Yalong Bay and now the fast-developing Haitang Bay – is determined to go head-to-head with assorted “Pearls of the Orient”. A good overall view of the island - which is huge - can be found on the Hainan Provincial Tourism Development Commission site, Explore Hainan - hard to find but packed with good visuals and geographic zone explanations. The new official all-in-one website, SanyaTour, that launched mid-2016 has brought fresh impetus to this sleepy island and improved accessibility for visitors - this, under the stewardship of the young and dynamic Director of the Sanya Tourism Development Commission, Fan Mu. He outlined to SmartTravelAsia.com how the holiday enclave is upgrading services and roads, bringing in more international flights, and creating more customized tours for families. There are flights linking almost 15 destinations including Japan, Korea, Russia, China, Hong Kong, and The Philippines, and scheduled services are expected end 2016 from UK and Germany. Southeast Asia is a prime target for expanded air services. A 'new' Sanya International Airport - which Fan says may host up to 50 million passengers annually with the added lure of a substantial duty-free offering - is an old dream that has been revived with a more robust interpretation following the launch of China's 'one belt one road' initiative. This is a place to explore for family holidays, corporate meetings, weddings, cruises, spas, and good old sun tanning. There's acres of beach. If you thought Sanya was the “Vladivostok of the East”, you’d be forgiven. Parts of the island are overrun by cheerful Russians, with all restaurant and shop signs in Cyrillic. Also in evidence are Koreans and Japanese. You'll find some finger-licking-good Muslim halal food too. But where the heck is Sanya? 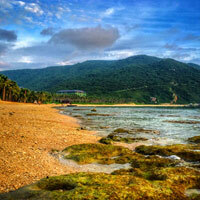 Before perusing this Hainan guide, first check out our Sanya Map. Sanya is part of Hainan – that includes the capital Haikou in the north, Yalong Bay in the Southeast, Haitang Bay just north of this beach playground, and Boao in the northeast – one of the southernmost islands in China, its pleasures well chronicled by a procession of mandarins banished from Beijing and hurled into exile quite literally at the “end of the earth”. So the Qing dynasty inscriptions proclaim, carved into two large boulders on the beach. This is one of the attractions of the island. So it’s a rock. Okay, two rocks. So what? Australia has Ayers and Sanya has Tianya Haijiao, smaller, smoother, more accessible, and with nary a whiff of koala poo. Oz had its convicts and Sanya its “treacherous” exiled officials whose descendents no doubt have evolved into the scoundrels we know today as taxi drivers. Had these early unfortunates had the sense to open a spa they could have minted millions. But, back then, a “spa treatment” simply involved pouring scalding oil on armed foreigners without the courtesy of a professional consult. It was not something they could advertise in a travel glossy. To be fair, taxis are improving and meters are more common. Cabbies apart, people are extraordinarily friendly. This is a huge asset, and one that makes it easier for visitors to deal with the limited English and other idiosyncrasies. One gent at a tourist site whom I asked for directions to the toilet, walked me the entire way there, ushered me in and stood by beaming, gesturing at me to get on with it. Do also see the Sanya Tourism Development Commission's original site at english.sanya.gov.cn/ though the upgraded version has more on offer at SanyaTour. Arriving at night on the Dragonair (www.dragonair.com) flight from Hong Kong, Sanya Phoenix International Airport makes a bold statement. Illuminated gloriously atop the building are two large, glowing pineapples. Have you ever actually walked into a pineapple? It took our flight a while to come in. On the first pass just as we were about to touch down the pilot suddenly opened the throttle and we whined up into the night sky again to do a long loop before coming down a second time. The pilot announced he had done this to avoid an aircraft on the runway. Sensible we thought. On a more recent daytime flight, this time on Hong Kong Airlines (www.hongkongairlines.com), the return trip to Hong Kong was delayed 10 hours as passengers sweated outside the “locked” airport. The facility only allows passengers in when check-in has commenced. The rest of the time you twiddle your thumbs outside availing of hot, sultry sea breezes and not much more save for a KFC with some soggy fare and modest, if life-saving, aircon. Also flying in are China Southern, Air China and local boy Hainan Airlines. Step off your plane and stroll into the terminal, a delightfully breezy alpine-lodge-meets-Hawaii-resort affair with vaulted wooden ceilings and perhaps the friendliest and quickest immigration counters in China. Sanya Phoenix Airport and the Haikou Melian International Airport (in the north) have flights in various combinations from Beijing, Guangzhou, Shenzhen, Shenyang, Wuhan, Qingdao, Hong Kong, Ho Chi Minh City, Kaohsiung, Frankfurt, and Russia. Several European and Japanese charters come in as well. A cheaper though more time consuming alternative is to arrive by train/ferry. Still, the flight connections are sorely limited and not always at times of your choosing. In the first half of 2016 a hefty 8.9 million passengers had been through Sanya Phoenix International Airport. Catching a taxi involves collaring a driver – or waking him up – explaining where you need to go (best done in Chinese or with a written address), and then haggling histrionically over the price. The asking rate for the 30-minute drive from the airport to Yalong Bay may be as high as Rmb200 though you should shoot for Rmb100 and consider yourself lucky if you settle for Rmb120. That would be close to expert level. More recently, with better highways in place, taxi drivers are becoming a tad more professional and meters are more common these days. Within Yalong Bay taxis charge Rmb10 to visit any resort, even if it’s the adjoining building. The airport to Sunny Bay fare is also around Rmb120 with an honest cabbie. Sunny Bay is a ten minute drive along the coast beyond Yalong. Private cars are often offered as an alternative when taxis dry up as often happens. This is common practice in Sunny Bay where regular cabs do not commonly cruise. For Haitang Bay taxis the charge rises to Rmb30 for resort hops. 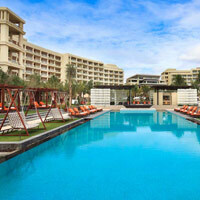 For resorts like Westin farther north along the strip, the asking rate can go up to Rmb40. In a metered taxi it is unusual for the fare to exceed Rmb30 or so with Haitang Bay unless headed to one of the extremities. Taxis from Haitang Bay to the airport charge around Rmb130 (by the meter) for the 30-40 minute drive. From the airport to Haitang Bay drivers will again demand the customary Rmb200. Stand firm and try for Rmb120 or, Rmb150. Expect to pay around Rmb120-Rmb150 from Yalong Bay to Haitang Bay and around Rmb80 from Yalong Bay to Dadonghai, the nightlife and restaurant strip closer to Sanya City. A string of new highways have made places more accessible. To focus on all the new infrastructure, our driver took us along an unopened stretch marked “NO ENTRY” and stepped on the pedal with cars approaching full speed head-on. While departing Sanya, bear in mind that the airport only opens an hour or two before each flight leaves. We arrived at 11am for a 1.30pm flight and found the airport padlocked and graveyard quiet until immigration and airport staff arrived on buses at noon. As the video monitor flashed an urgent "check-in now" sign for Dragonair, travellers wrung their hands outside the locked glass doors. Once through with the quick and cheery formalities, things are painless and pleasant. This is perhaps the only airport I know of that gets chained and padlocked every time a flight leaves. If you are inclined towards duty-free shopping, you’ll find the usual clutch of slightly expensive Johnnie Walker, Chivas, cognac and wine. The duty-free price for a one litre bottle of Johnnie Walker Black Label at Sanya Phoenix International Airport is Rmb256 and a one litre of 12-year-old Chivas is priced the same with JW Double Black at Rmb306, and Blue Label at Rmb1,480. Check out an unusual selection of fragrances from Kenzo, Nina Ricci, Ferragamo, Burberry and Anna Sui. You might also head across to Haitang Bay's lavish space-age Duty-Free shopping complex for a brisk walkabout. The gleaming silver Haitang Bay International Shopping Complex (run by China Duty Free Group) has designer brand fashions by the acre but be warned, the prices are not the lowest around. The currency exchange rate is roughly US$1 = Rmb6.87. Or opt for a glass-encased scorpion or a pair of hugging pandas that squeak "I love you". Passengers can pay Rmb200 for one-hour access to a VIP First Class Lounge after perusing a sign that reads: "Offer only for CRUSH Room". Right. 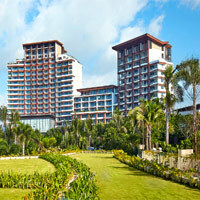 On with this look at Hainan conference hotels and spa resorts. It all started with those long-limbed lovelies. Sanya sprang onto the world stage with the Miss World pageant. A bevy of bikini-clad beauties descended on the island to strut their stuff on white-sand beaches, languorously draped around the pools of the Sheraton Sanya, determined to save pandas, hug trees, cheer whales, and bring up orphans – if there were any left over after Brangelina adopted half of Africa. Ask Bishop Desmond Tutu who his mother is and he’ll probably say, “Angelina Jolie.” Other aspiring Miss Worlds said the greatest living woman was Mother Theresa (then dead for several years). It attests to the other-worldly sense of this place where you lose all track of time. Miss World could be back in December 2017. Another spin-off is the New Silk Road Model Contest in which young ladies drape themselves over sailboats – and rich persons – demonstrating that Communist China is not just some Rigid Monolithic Single Party State, but actually a Rigid Monolithic Single Party State Where Ladies Have Nice Legs. Nowhere is this more evident than in the purpose-built Yalong Bay playground in the south of Hainan Island, with its megaresorts and arcing sandy bays, surprisingly reminiscent of Bali’s Nusa Dua. Here you’ll find the likes of Marriott, Hilton, Ritz-Carlton, Sheraton, MGM and St Regis, all very creative confections. Closer to Sanya town near Dadonghai are the Mandarin Oriental Sanya and the Banyan Tree Sanya along with the more hotel-style InterContinental. And around 30 minutes up the highway heading north along the coast from Yalong Bay is the new luxury strip of Haitang Bay with players like Wanda, Conrad, Doubletree, Sheraton, EDITION, and the Luxury Collection Royal Begonia plonked down seemingly randomly along a fine beach. Big-name brands like Sofitel and Grand Hyatt and Rosewood have arrived, and One&Only, Atlantis (with its much anticipated dolphin show) and Waldorf Astoria are in the pipeline, though Waldorf appears to have foundered. The Sanya EDITION opened December 2016. Don’t expect cut-rate prices anywhere. Your wallet will get a fine workout though summers have slowed with local travellers heading offshore. Remember, Sanya is not just some one-horse town. It has pineapples and rocks. And Hainan chicken, though this may be better sampled in Hong Kong or Malaysia. The thing about the properties in this Sanya resorts review – especially in Yalong Bay and Haitang Bay – is that the beaches are actually quite good. And resoundingly empty. Dadonghai offers a coral coast and the beaches are artificially sanded and not really for swimming. The weather is bone-roasting tropical most of the time with a mild nip during winter. This carefully planned development appears to genuinely have the area’s wellbeing at heart. The hotels are grand, the roads tree-lined with plenty of greenery, the waters shockingly blue, the air breathe-it-all-in clean, and the service friendly and elaborate. Very elaborate. At one restaurant I asked for salt. The waitress scratched her head, smiled and brought me in rapid succession, soya sauce, sugar, chopsticks, a glass of water, and the menu. That’s what I call service. I later picked up a saltshaker from the adjoining table. I thought about getting my meat “well done” but my flight was leaving the next day. 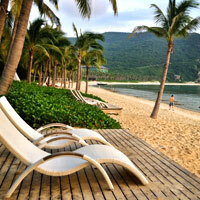 The best Hainan resorts are actually rather good. The software is what needs work. English is picking up, but slowly. Don’t be in a rush. If you’re stuck, settle down and find a wife – preferably one that speaks Chinese, owns a taxi, and knows the way to the airport. See our Sanya Map. If the New Silk Road Model Contest is not for you – or your wife is planning the trip – as any Sanya fun guide will be quick to point out, the International Wedding Festival runs every year in November. Couples renew their vows, get married, and celebrate their anniversaries before the aforementioned ROCKS. Divers will head to Wuzhizhou Island for underwater adventures. For water babies and yacht aficionados there's the new Sanya Serenity Marina (serenity-marina.com), well located a short hop from the Yalong Bay playground and Sanya City. The 325 'full service' berths are lined up serving 10m to 40m vessels accompanied by restaurants, club, swimming pools and more along the western coast of the Dadonghai peninsula. A 1.2m breakwater ensures calm waters. The 5,000sq m Yacht Club encompasses a gym, ballroom and conference space along with extensive children's facilities to add muscle as a family-friendly spot. Travellers can engage luxury charters from Serenity Marina for cruises, fishing or sunset tipples. To sample the fabled hot springs and spas of Nantian stop by the Sanya Pearl River Nantian Hotspring Resort that boasts over 60 steaming pools – all at different temperatures – along with fairly modern rooms and villas. The springs in this area are attributed with medicinal and curative powers. At any rate you’ll feel refreshed and it won’t break the bank. The hot springs are open 8am till 11pm. The place is about a 30-minute drive north from Yalong Bay on the East Expressway and less than 10 minutes from Haitang Bay. A dip in the spa pools will set you back just Rmb198 per person per day with water temperatures ranging from 39C to a zesty 45C. Some pools are more private than others but expect a communal dip with gleeful crowds especially at the fun pool for kids with water slides and a host of splashdown equipment. Expect garden areas, a lake, hammocks, and various room types (there are over 500 choices but you would never guess it looking at the place). Pick a spot next to a field or close to the springs. The top end here is a Villa Suite that is pushed for honeymooners. Expect gleaming wood floors and fairly contemporary surrounds though this is of course not in the same league as Haitang Bay neighbours. A spa is on hand and a 60-minute Bali Royal Massage will pinch Rmb588 from your wallet. Alternatively drive up into the hills to gawp at vanishing tribal communities like the Miao, Li and Hui. Later, stroll through Longevity Valley near the historic Nanshan Temple where the folk just live on and on and on, watched over by the more recent and towering addition of the 108m Guanyin Statue (also Kuan Yin). There is even a Longevity Festival in September. The temple with its beautiful golden deities and swirling incense high above a series of stepped pavilions and gates was once a place of serene mystic contemplation. Somewhere along the way it turned into Disneyland. The temple is at the heart of the vast Nanshan Cultural Tourism Zone, a bustling cultural theme park within tropical forest and parkland, where tourists on trolleybuses trundle around sights like the “Dharma Door of Nonduality”, “Auspicious Garden”, and the “Brahma Bells Collection Garden”. If all this leaves you flummoxed, try the “Tree Houses” or the vegetarian restaurant. It costs Rmb150 to enter the complex and you’ll need another ticket to board the trolley car. The authorities are pushing for conventions to fill hotel rooms and villas. Still, it is a pleasant enough excursion. When you see the t-shirt and trinket stalls you immediately know you are somewhere special and spiritual. After all, isn’t that how they do it over in Thailand and Bali? Nanshan Temple is a 50-minute to one-hour drive from Yalong Bay along the Western Expressway on the southwest of Hainan Island. From Yalong it’ll cost about Rmb150 one way. Book a roundtrip. Just up the coast is scenic Sanya Nanshan Dongtian Park (www.sanyapark.com/en). 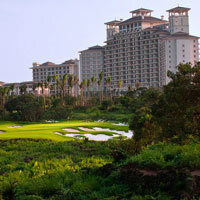 Golfing in Sanya is a favoured pursuit of many. The 18-hole international Yalong Bay Golf Club (www.yalongbaygolfclub.com) is a popular choice right next door to the Sheraton, Marriott, Hilton and Ritz-Carlton. The Sun Valley Golf Club offers 18 holes priced at RMB1,000 per person with caddy, cart and transfer to any Yalong Bay resort. The Sanya International Golf Club is close to the airport and the Luhuitou Golf Club is in Dadonghai. Also look at the Sanya Haitang Bay Peninsula Golf Club, the nine-hole course at the Kempinski Haitang Bay (now a Wanda), the members-only Forest Valley Golf Club and the Clearwater Bay Golf Club with its green landscaped acres, residential buildings and artificial lake. Farther north in Haikou Mission Hills has three state-of-the-art courses including the 350 acre Blackstone Course (7,808 yards par 73, www.missionhillschina.com), the Sandbelt Trails Course (7,297 yards par 72), and the classic Vintage Course. The Mission Hills Hotel – Hainan (www.missionhillschina.com), is a 525-room Hainan golf resort serving up panoramic green views, a spa, a lazy river tube run and a well set-up kids' club. Expect free internet and rates from Rmb1,280. All resorts in the various tourist developments have easy access to greens and can help arrange your big swinging morning or afternoon. Get addresses written down in Chinese. Thus armed you are invincible, until you encounter a taxi driver. This can be a hair-pulling experience as the meters, proudly displayed, are seldom used. A taxi ride from the airport to Yalong Bay could cost anywhere from Rmb120-Rmb200 depending on your negotiating skills. The actual meter fare will be closer to Rmb120. It's about the same or just a tad more to Sunny Bay. Yalong Bay is well removed from the nightlife and beach strip of Dadonghai (20 minutes), Sanya City and Bay (30 minutes), and the airport (30-40 minutes), so any excursion will involve animated haggling though a good hotel doorman will probably handle this for you. Within Yalong Bay the norm is a Rmb10 flat fee, even if the hotel is next door. Here it is simplest to just walk down the beach. In Haitang Bay taxis appear to use meters, even for short hops. Any Sanya fun guide worth its salt will rave about after hours but, in truth, Sanya nightlife and eating out is a bit overrated. Most people tend to eat at their hotels, preferring to haggle later with taxi drivers once fortified by a few beers. The most interesting food perhaps is in the small street cafes of Sanya City. Have a trawl and dive into something if you have someone along who can translate. 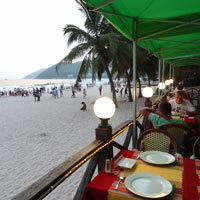 At Yalong Bay, a local-style haunt with a heavily rustic flavour is Hainan Renjia, just a bit away from the main strip. Sit under a thatch-roof hut and nibble on honey fried pork, mama papa dofu, and roast chicken, all served with huge lashings of garlic. The upscale nightclubs at the MGM Grand Sanya where throbbing music and dancing lights awaited the well-dressed set are dimming their lights and making way for events space. At night, the Dadonghai area is alive with discos, KTV and open-air cafes where the signs are all in Russian. I didn’t speak Chinese or Russian and had to make do with sign language. The touts were good at this with nimble fingers suggesting that women in this area are keen on demonstrating their hospitality in the privacy of your hotel room, or theirs. It is remarkably friendly seedy though with none of the harsh thug-in-the-face overtones of larger cities unless you wander down the wrong alley. Start out at the kosher expat-friendly Allen Story (said Allen seems to have an arm lock on the night scene here), where neo-classical Versailles meets tin mine and Wild West. The lights dim at 8pm and the disco crystal ball starts twirling sending pinpricks of light moving about the walls in a throwback to the ’70s. 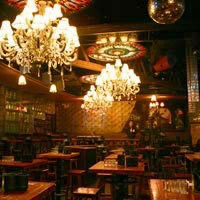 Ornate chandeliers glow above the bar tables, music throbs, and the video screens blaze with pop – or sport. I listened to how Clapton plans to Change the World while watching a video of America’s Funniest Pets, an odd but strangely relaxing combination. The Dadonghai nightlife strip is a sudden racket of neon about 20 minutes from Yalong Bay and just before the Sanya River Bridge. This is karaoke country. Walk past or into Allen Lounge and Bar, Allen New KTV, and a host of neon-flashing nightclubs and dance clubs like the two-level disco bar Tommorow’s Dream (tel: 8860-9898) that doubles as a hubble-bubble “sheesha” joint. Staff is courteous and friendly. Here too the music is ’70s remixes. Later things get louder and boisterous. Someone asked me if I was Russian and I knew it was time to leave. Other options include the Dolphin sports bar along the bay, 88 Disco and SOHO for dancing after a few tipples. The four-star Sanya Guoxi Hotel (www.guoxihotel.com) runs "ladyboy" drag shows in its Dynasty nightclub, which it describes as featuring "brilliant lights, balconies of Europe and Chinese ethical styles... a complex for business and vocation." Sanya nightlife is slow paced and idiosyncratic. Don't expect a Patong or Pattaya here on Hainan island even though the transvestite show makes a stab at it. Nightclubs change constantly and names get replaced like underwear but they are all fairly similar. Check if it is a hostess bar before you enter lest huge bills be presented upon your exit. Yalong Bay is as good a place to start our Sanya resorts review as this is where most of the the prime properties have been thus far located. Many of the hostelries in the area are grand and vast, all are clean, even the smaller establishments, and pretty much all are positioned either as spa getaways or Hainan conference resorts, or both. It goes without saying that with very few exceptions, this is a top family destination and kids are generally welcome. But first, the newish development of Sunny Bay. This lies a few kilometres to the west of Yalong and is accessed via a 5km private road leading to a pristine arcing bay hosting the ultra modern six-block Park Hyatt Sanya, Sunny Bay Resort (October 2014) and, later, the Chinese-style 102-room Andaz (2019). Much of the scenic beach is not really open to swimmers (with the rocks at low tide). This is a beach for sunning and preening, to see and be seen and a great spot for selfies. Andaz has a small stretch of wade-in water. Bai Fu Bay is a five-minute boat ride away for clear water and snorkelling. These are not two peas in a pod and the DNA is markedly different. Park Hyatt is a resolute city slicker with all the attendant comforts you might expect of a luxury lifestyle downtown escape, complete with seamless wall-to-wall air-conditioning. It may seem trite to mention aircon in a posh hotel but this hideaway takes it very seriously indeed. So much so, the entire space is cooled - and connected - with few open corridors to get sweat under your Polo collars and, remarkably, no balconies with the rooms (just 28 afford this resorty luxury). For the sweat averse this will be heaven, while resort purists may take a while to get used to the concept. Consider it an "urban resort". The hotel is a series of brooding grey stone rectangles, a Temple of Doom meets Game of Thrones fantasy, and you will be forgiven for thinking the Mother of Dragons is about to swoop down on a fire-breathing beast. It is slick, modern, minimalist, and playful. Walk in through a charcoal entrance down a hushed dark corridor lined in red lacquer and chocolate leather to a high ceiling reception with plenty of light, lashes of crimson, woody tones, and supreme whimsy. You are greeted by the de rigueur plump, over-inflated Chinese cherub in bronze grinning slyly just above head height, low wooden tables extending in both directions along the room with cowhide throws, chessboards and ceramic oddities in metallic hues, gold and lacquer. Staff are young, serious, and attentive but not much English is in evidence. The guests are predominantly local with a sprinkling of flushed European faces over a weekend. The room is spartan but neat, in straight sombre lines, with a large bed facing a humungous flatscreen television. Cool darkwood flooring runs underfoot. A diwan runs along the windows, which are not floor to ceiling alas, but are very welcoming of light and views. There are large tactile easy-to-work switches by the bed and a host of other sneaky switches you may need to master for the double blinds and lamps. The high ceilings create a regal sense of space. The bathroom is orderly and well designed with a separate controls for the hand and rain showers so there's no struggling at 2am trying to find the right balance of angle and torque. There's also a civilized marble slab in the shower cubicle to park your bottom on if you really want the Bergamot 22 toiletries to work their full magic. Expect a feisty hairdryer, essential toiletries including toothpaste, a rear-up electronic Japanese potty, BOSE sound, laptop-friendly safe, iron and ironing board and a Ferrari-red coffee machine. Building 7 is where the restaurants are located and next to which the long 110malfresco lap pool runs, often bedecked with giant inflatable toys. There is a 25m indoor pool as well. The kids' pool is closer to Building 5 and, everywhere, manicured green lawns beckon with vast stretches of timbered boardwalk. The buildings themselves resemble a modern art museum more than a hotel but this just adds to the charm, with all the design resolved into neat lines and rectangles. The beach area is pleasant and provides good strolls and jogging with hammocks and sun chairs for the less physically inclined. Pick from five restaurants. The Chinese nosh is superb and highly recommended. Breakfasts and Western menus are not as lavish as at some Haitang Bay spreads but the focus here is on quality. At the prices here - though you may snag an Rmb2,000 deal - you'll need top notch service and that's what this resort tries hard to provide with discretion and brisk attention to detail. Be prepared to walk a lot to solve the Park Hyatt Sanya's enduring and endearing corridor riddles. 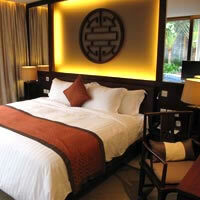 This is a prime Sanya luxury hotels pick with style and character. It is secluded and private. It is just a wee bit off the Yalong Bay stretch and taxis may charge a little extra to come and pick you up. The concierge does a good job though of arranging transport for all. The secluded Park Hyatt Sanya compares well vs St Regis and Ritz-Carlton but is a tad less 'international' in terms of service and language comprehension. This is not unusual as several hotels on the island cater almost exclusively for Chinese guests. The St Regis Sanya (opened late 2011) sprawls regally over one end of the bay. This secluded location offers a measure of both privacy and space, the latter exploited in full measure by the soaring, cavernous architecture, grand like the Smithsonian Museum yet somewhat reminiscent of a baleen whale sunning itself. It is lush and lavish, the signature saffron building columns marching forth from the breezy lobby in military precision to greet the sea. The St Regis is a huge construct, encompassing a series of lush lagoons and inviting pools, by the seafront, or meandering between the hotel blocks. 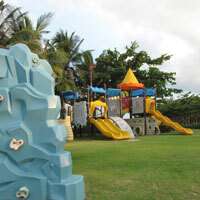 At one far end is a generous space set out for kids with a well-equipped outdoor play area. Manicured lawns offer grass underfoot and, of an evening, floodlit fountains dance while the waves lap at the vast expanse of private beach. Settling in is easy. Buzz a butler and get unpacked, have your bath drawn, or simply seek suggestions for holiday ideas. There is free Wi-Fi throughout the hotel – free in the lobby and charged at Rmb100 per day elsewhere, including in the room. All 401 rooms serve up spacious, coddling bathrooms, twin vanities (the basins set in glowing alabaster), Remede toiletries, a rain shower, and a bathtub with a view. The living space, starting at 73sq m, is large, bright and airy with a fair bit of hi-tech to play around with. Get familiar with it. Watch movies on a large 46-inch flat-screen TV, savour the evening breeze on your balcony, soak in the tub with a view, or simply relax with a good book on your giant bed cradled by hypoallergenic pillows. If it's too cold, switch off the aircon and flip on the ceiling fan. Bring in the tropics whenever you wish. Some ground floor rooms also offer direct access to a swimming pool. Expect a Nespresso machine with complimentary coffee shots, DVD player for those lazy movie afternoons, cool marble floor, a work desk with dataport, iPod dock, and a few three-pin sockets. The furniture is classical in dark wood. To say these rooms are spacious is an understatement. They are vast. And, given the spread of the resort, some of them require serious legwork to get to. Of course, buggies are on hand too. All in, it is a regal and relaxing ensemble with a few minor niggles. The hot water arrives at a leisurely pace, several balconies look onto each other and some bathtubs are less than private with the blinds raised. Service though is exceptional – attentive and welcoming. Butlers are ubiquitous and quick to respond, something of an exception in laid back Sanya, and this is where The St Regis scores highly. The hotel offers a wide variety of dining options for gastronomes. For wellness treatments, massages and all manner of lotions and potions, head to the Iridium spa. Relax in the crystal ice grotto or mineral salt chamber, depending on your mood. Unsurprisingly, given its size, the St Regis is a handy address for corporate meetings - and incentive travel - in Sanya with a range of versatile function space, the largest at 8,784sq ft. The seafront can also be utilised for events and weddings (the central lawn can accommodate 400 persons for a gala evening). For something really spoiling, opt for the Presidential Villa and perhaps a yacht pick-up. At the other end of the strip, hip relative newbie MGM Grand Sanya rose in place of the old Gloria, the very first Yalong Bay occupant. This is an unabashedly mod hotel catering for the young and restless with a blend of clean architectural lines and plenty of pool-party space, and chill-out music. The nightclubs and discos are gone, alas, the space handed over for events, and the latest feather in the hotel's cap is its dog-friendly approach, with Dog Rooms featuring dog food and poop scoops but no carpets or breakable stuff. This initiative launched in December 2015 and it seems to have pet owners howling in delight. The catch? Friendly dogs only, and under 16kg. Walk in to a bird's nest lobby overlooking the swimming pools and azure sea. If you must, head straight for "Wet Republic" the non-stop party pool hangout with DJs, cabanas and fun galore. Explore other multi-level pools - with tiers of cobalt blue sun seats - the largest being 2,000sq m. The children's pool is equipped with water slides and toys to keep the tykes entertained. 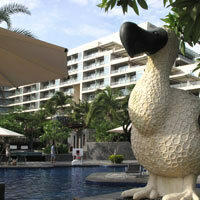 Equally entertaining are the funky statues all around the resort. Spot a dodo and, of course, the signature gold MGM lion. At the Papillon Music Bar and lounge jive to dance beats by celebrity DJs and enjoy KTV (in premium rooms). Head to the Dragon Club or retire to the Cigar Lounge or the SHO Spa. But first the lobby bird's nest, which is actually a butterfly cocoon, magnified. It is a touchy-feely space with low-set divans and stepping stones leading through black-tile ponds. Don't fall in. Definitely make time for a bite at Pin Ju for excellent Chinese food with the sort of variety and flair unusual for Sanya. MGM is a hotel for family fun or a honeymoon riot. It has few pretensions – despite the nightclub dress code – and everything is designed to get guests to relax and unwind, speedily. Bike around at no charge on pedal power if you wish to burn off calories or hike up to your sea view room. A Deluxe Ocean View serves up a grey marble floor with a carpet trimmed around the bed. It is neat and simple yet bright and inviting. There are two three-pin electric sockets on either side of the bed. Thoughtful. Recharge everything at one go. Find a large flat-screen TV, a sliding glass partition leading to the bathtub, twin vanities, rain shower, iron and board, laptop -friendly safe, and coffee maker. The hotel's 675 rooms are set in two blocks and start at 52sq m. Balconies are fun but not private. If you need a hip Sanya hotel bristling with entertainment, this is probably it. The Sheraton Sanya Resort, where the sashaying Miss World lovelies first made their mark (three stagings have happened here), opened in 2003 and is set smack in the centre of the Yalong Bay strip, very appropriately, as this is a hotel that has done much to place Sanya on the travel map. It features a breezy and elegant teakwood lobby, again very Balinese, with more swimming pools than you can wiggle your toes in and some attractive water features. Indeed, delightful water features are the leitmotif of this brisk, yet relaxing, beach resort. Beyond the lobby, a water pool leads the eye to the horizon and the eye-popping blue. The place works well as a family-friendly Sanya resort as well as a wellness getaway for the more romantically inclined – just pop over to the spa that also does special treatments for men, thank heavens, including the “Gentlemen’s Own, for all skin types”. This 511-room resort includes 49 suites with the prized Grande Deluxe Laguna rooms opening onto a lagoon pool. Most rooms offer balconies with breezy views. In a Deluxe say hello to cream tones and pastels with plenty of space and a simple but sound and familiar design that will calm parents' nerves. The room does not try to outwit the tired and jet-lagged with hidden contrivances and clever buttons. Expect a cool tile floor, a flat-screen TV with DVD player, large tactile room switches for quick control of pretty much everything, iron and ironing board, electric kettle, a laptop-size flat safe, and a rainforest shower in the bath with a separate soaking tub set behind white louvred wooden shutters. The light wood accents are easy on the eye but the results on the weighing scale may prove more startling for well-fed city-slickers. Suits can prop up by an oval glass desk with a two pin and traditional Chinese three pin splayed crow's foot plug sockets. Of an evening, plonk down in the balcony for grand views of Yalong Bay over acres of mature green. The hotel has a clutch of private villas, including one spacious 448sq m Presidential Villa (with a courtyard, garden and tranquil water features). Featuring light pastel décor and woody tones, all villas come with 42-inch flatscreen TVs and a private swimming pool looking past the gardens to the sea. Bathrooms at the 130sq m Deluxe Ocean Front One-Bedroom villas are in marble and an outdoor deck leads to the pool and private garden. Hotel business features include free WiFi in public areas, free whirls on the iLink computers in the lobby and a 1,250sq m ballroom catering for up to 1,400. A further 11 meeting rooms from 22sq m to 150sq m offer versatile space for MICE groups and corporate meetings making this a prime address if you are hunting for good Sanya conference hotels. Toss in a white grand piano that plays along merrily on its own, jet skis, kayaks, decent baby-sitting services, a terrific beach and a raft of water sports and it’s clear to see why the Sheraton is a hotel with a difference. Need a Sanya resort wedding? Check it out. Put it down to creeping midlife crises, but the red Ferrari on show in the lobby always sets my pulse racing. I guess if you have a Ferrari, why not park it in the lobby and make a statement. The Ferrari was actually bought for a hotel lucky draw when the place first opened but the project ran into regulatory problems and the car has become instead a lobby showpiece with zero carbon emission. It is always gleaming and polished and quite popular with the selfie crowd. Immediate neighbour, the Sanya Marriott Yalong Bay Resort & Spa boasts 456 rooms (including 24 suites) with balconies offering sweeping views of Yalong Bay and the sea. From May to October 2017 the lobby and rooms undergo major renovation. A nip and tuck is certainly welcome. The hotel has been designed to respect and showcase local traditions. This is does admirably. Dotted among the extensive gardens you’ll spot striking stone statues of fishermen and villagers. Do not ask them for a beer; not even after your tenth drink. But, if you’re lonely, you might strike up a conversation with one of these mysterious figures. Rooms are bright and friendly. You’ll find a flat-screen TV, work desk with varied three-pin sockets, a small safe that will hold a notebook, digital clock, iron and ironing board, a hair-drier (thankfully not nailed to the floor), and a bathroom with separate shower and tub. The balcony is of decent size and basic decorum is expected. A sign on the sliding glass door discourages the hanging of laundry outside, an instruction cheerfully disregarded by many. Of course you are welcome to lie back and dry out while catching some serious rays. The two hardback wooden chairs are sufficiently stern to keep you alert and focused on some dazzling sunrises. Hotel staff is on the ball, exceedingly attentive, and responsive. You will be garlanded, thanked, and bowed to constantly. Smiles are ubiquitous. 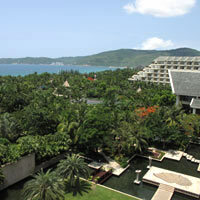 The Sanya Marriott has extensive gardens to get some grass underfoot when you are not leaving footprints in the sand. The beach is delightful (the same unblemished stretch extends from the Sheraton past the Marriott and Hilton to the Ritz-Carlton). Hop onto a water scooter, paddle out in a kayak, windsurf, play volleyball, or cool down in one of the large freeform swimming pools. Indulge in some face painting, learn calligraphy or origami, or try kick-boxing. There is a kids' club for juniors – with treasure hunts, kite-flying, air hockey and PlayStation – as well as three golf courses within a 30-minute radius for the swinging set. This is a child-friendly resort but also fares well among the popular Sanya conference hotels with 1,250sq m of function space. The Quan Spa, in its own private garden setting, has spacious treatment rooms and an arsenal of cure-all remedies. It is a relaxing enclave easily accessed from the hotel yet set apart. Herbs and unguents are sourced in Australia and China and offer an “east meets west” menu. Pick from massages, scrubs and wraps or long all-in-one sessions. After hours, dine Japanese or Chinese and then chill out at the upper-level lobby bar with open views of the coast and live music. The Marriott is friendly and accessible yet with exclusive nooks and crannies. Pets, apart from blonde secretaries, are not permitted. The Marriott rates well among the top Sanya spa resorts. 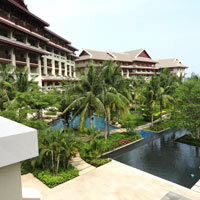 Next along the bay is the Hilton Sanya Resort & Spa boasting a further 400m of white sand beach. There's free WiFi in the lobby. The rooms encircle and embrace the central freeform pools including a mock lagoon with an artificially sanded “beach, manicured gardens and walkways. The views extend to the hills on one side and the sea on the other. The Spa Retreat serves up treatments galore and fitness equipment, sauna, gym and aerobics studio are close at hand. Those wishing to work up further sweat can do so at the two floodlit tennis courts or avail of the water sports options along the beach. In-room expect traditional decor with contemporary touches, a 42-inch flatscreen TV, a DVD/CD player, iron and an ironing board. Some rooms offer glass partitions instead, catering for the MICE meetings market that every hotel in Hainan appears to be chasing down. 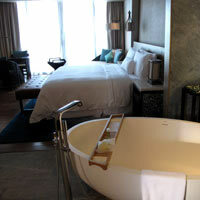 Other rooms offer the novelty of bathtubs positioned by the balcony offering external views. The Hilton’s signature .IZE restaurant follows a water theme with other outlets focusing on “natural” design along earth, wood, and fire expressions. Families will be happy with a kids' club and babysitting service. As with other Sanya conference hotels, the Hilton is no slouch at serving up meetings and weighs in with 3,000sq m of space to play with plus 800sq m of lawn. The ballroom can hold 1,000 people cocktail style. The Ritz-Carlton Sanya opened mid 2008 and is a stately affair with clean, structured lines and dark wood redolent of the Beijing Summer Palace. The eye is led unerringly in a straight line past black-tile ponds and rows of trees to the inviting oceanfront pool and the shimmering expanse of white beach, aided in small measure by a generous sanding. At the very end of the Yalong Bay strip, just before the St Regis, the Ritz-Carlton affords a sense of exclusive luxury with 450 rooms, the smallest of these an echoing 60sq m. Yet it is extremely family-friendly and relaxed. And WiFi is free. Expect views of the sea, rolling hills or mangroves from a large balcony, a huge walk-in closet, iron and ironing board, flat laptop safe, flat-screen TV (with a monitor in the bathroom), broadband (Rmb100 per day), DVD player and a Bose iPod dock. You’re all set to work or party. Be sensible and choose the latter. Electric push buttons operate curtains and lights and the comfy plumped up bed commands attention. A partition glides away revealing the bathtub. Roll out of bed and literally plunge in. The villas are the highlight. The smallest one-bedroom villas start at 130sq m (three-bedroom villas go up to 350sq m) with decent sized living rooms, cool bedrooms, all featuring timber flooring and spacious baths. Step out into the patio to find your own private plunge pool and lazing sala (pavilion). Internet is complimentary. Expect three LCD TVs, a BOSE sound system with DVD player and iPod port, fussing butlers and, incredibly, a "romanceologist" to up the ante if all this and your imagination will not suffice. A bit twee unless you've forgotten how to kiss. The three-bedroom villas offer a private pool and 367sq m of living space. The expansive 2,788sq m ESPA at the Ritz-Carlton Sanya will serve up exotic treatments no less and those in a hurry can waltz out to the wedding chapel on the beach for a romantic Sanya resort wedding. For kids there’s the Petite VIP programme that includes Petite VIP massage and there are special treatments for pregnant women too. Later, exhausted by four swimming pools, two tennis courts, volleyball, beach soccer, yoga, kinesis training, and eight fine restaurants, retire to your room and check out the pillow menu. You’ll need it. The Ritz-Carlton offers 1,700sq m of conference space and plans to position itself as a top MICE contender as well as one of the must-see Sanya luxury spa resorts aided in some measure by a ritzy high-end shopping arcade featuring the likes of Louis Vuitton, Salvatore Ferragamo and Ermenegildo Zegna. Sanya luxury shopping? Look no further. The array of designer brands here is a first for Sanya. The Huayu Resort and Spa (formerly Crowne Plaza Sanya) hosted Miss World 2007 and even Mr World, though not at the same time or we might have had a Mrs World and Baby World on the way. This is not a beachfront hotel though it offers a shuttle to a stretch of sand. The 466-room hotel’s main strength is as a Sanya MICE hotel, a meetings specialist, with a regular train of buses disgorging excited conference-goers. The main ballroom handles 1,200 theatre style and a host of minor ballrooms and function spaces stretch accommodation substantially. Need to arrange a meeting on the beach? This place will set it up. In-room broadband is complimentary and WiFi is free in meeting rooms, the lobby, and pool area. The hotel complex houses a shopping “village”, townhouses, hotel rooms and a few villas radiating out from a striking Chinese-style pagoda that functions as the design centrepiece and lobby. A large freeform pool offers relaxing diversion as does the spa. Premier Rooms are pleasant with timber floors and large work table and TV. Internet is complimentary in-room. While not in the same league as the beachfront properties, the Huayu Resort and Spa is among the better equipped Sanya MICE hotels and is an okay choice for a Hainan conference. The 787-room Horizon Resort & Spa (formerly Resort Horizon, indeed the two entrances feature two different names, confounding guests) has spacious landscaped gardens for those flashy Sanya resort weddings, inviting large free-form pools with sculpted rock formations, waterfalls, whirlpool and Jacuzzi, exciting splash slides and water jets, and extensive on-the-beach offerings from romantic dining to adrenaline-pumping water sports. 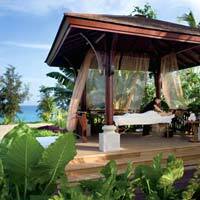 The de rigueur massages are served up at the Lanikai Spa. Rooms are smart and airy, most with balconies overlooking the ocean, and wooden floors leading to the open bathing area and tub. Expect in-room internet, a kids' club, and ample kitchenware and a washing machine in the suites. Horizon is one of the older residents of the beach. The large, spread out, Balinese-style Yalong Bay Mangrove Tree Resort is where the Mangrove Tree Spa kneads tired flesh with liberal applications of oil and aromatic unguents. Try a wrap, facial or scrub. This is not just a bland addition to the mushrooming ranks of Sanya spa resorts: the hotel offers 1,200sq m of meeting space and several restaurants including signature Thai in a breezy open-sided hut facing water features and the gardens. Also expect tennis courts, gym, a kids' play area, a large swimming pool with water slides, 260m of beach and sea views from most of its 502 rooms. While the building itself is unremarkable save for its scale – like any large hotel – it is neat with style and colour inside with a nice entrance and water features with a sea view to welcome you right away. This is a decent option if you’re hunting for Sanya family resorts and child-friendly establishments. 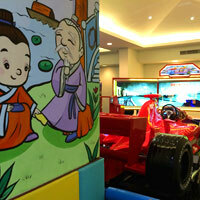 Check out the Indoor Kids House set up with an adventure gym, slides and even a red Ferrari racer with video simulation. The race ride costs Rmb30. Kids can opt for t-shirt painting (Rmb35), among other distractions, none free alas. There's also Jackstraw's Farm with organic vegetables and scarecrows flapping in the breeze. Wander down for a look at real veggies and some tame farm critters. Rooms are pleasant with Thai silk flourishes and colours. Opt for an Elegant Sea View Room just to be sure. Yes, that's what it's called. There's 150 acres to explore. The 358-room Holiday Inn Resort Sanya Yalong Bay is a well-kept place with meetings and banquet facilities and makes the most of its quiet location at one end of Yalong Bay. Rooms are are carpeted and modern with TV, the business centre has Internet access, the Little Stars kids’ club takes care of the three to 12-year-olds, and there is a spa with hot stones, aromatherapy and shiatsu. Set away from the beach, and favoured by tour groups, the Cactus Resort (from Gloria Hotels & resorts) is among Yalong Bay’s cheaper options. While not exactly a Sanya budget hotel, this establishment follows an Aztec and Mayan theme that keeps things surreal including cactus motifs. As elsewhere in Hainan, staff struggle with English, but do try hard. In-room expect internet access, a safe, satellite TV and hairdryer. There are babysitting services and activities include mountain biking, tennis, mini golf, and pool volleyball. There is a large pool area around which the resort is built. The breezy Mediterranean-style Aegean Conifer Suites Resort Sanya has largish 64sq m suites each with a kitchenette, Jacuzzi perched on the balcony, LCD TV, washing machine, stove and cutlery. Larger suites come with iron and ironing board. Toilets are modern and chic. In-room Internet is free. Outside look for further Greek flourishes – startling white stucco walls, bright blue-and-white striped chairs, and an ocean-view pool. You could be on Mykonos, at less than half the price. Tiled walkways lead through the garden and pool area to a narrow beach that is unfortunately not among the best stretches of sand, and a boat jetty. Alternatively get pummelled and rubbed with aromatic oils at the spa that offers a range of wellness menus from massages to more robust treatments. Resort Golden Palm was a pleasant four-star set-up, sprawling across 43 acres along a lake with a view of the sea across the bay front road and park. The resort is long rather than tall with red-tile roof. Think swimming, mountain biking, kids’ club, karaoke, and acupuncture. The hotel website candidly declared it not only receives “salary visitors but also famous people”. Good to know. By late 2016 the resort could not be found online. The Pullman Sanya Yalong Bay offers 115 well appointed villas with pools and 77 rooms, along with a spa, a fitness centre and good conference and meeting facilities. It is a stylish option with rich Asian decor if Sanya villa resorts are what you are after. Managed by French chain Accor, facilities and activities include a kids’ pool, a kids' club (in several groupings for newborns to 12-year-olds), a game zone with table tennis, pool, cards and chess, outdoor swimming pool, babysitting services, yoga, fishing, cycling, horse riding, and free Wi-Fi internet access in public areas (Rmb80 for 24 hours in-room broadband). That's more activities than you can reasonably shake a stick at. Rooms are smart and contemporary with spacious balconies overlooking the pool and a large divan for sun-lounging or a snooze. There are three villa categories to pick from. The Thai style as an example, uses classic Thai furnishings and motifs to set the mood and runs from 50sq m to 60sq m. The electric buggy will take you down to the villas, rattling over wood-plank bridges, past fish ponds and manicured greens. Expect a wood shingle roof and a cobalt-blue private pool. A big Jacuzzi overlooks the pool next to twin vanities, a big rain shower area and an outdoor shower. You can step right out of bed and into the pool. The terrazzo floor with tasteful inlay is cool underfoot and guests here will enjoy space for a small walk-in closet, living and dining areas, an iron and ironing board, a laptop-size safe, a flat-screen TV and DVD player, a smart work desk, iPod dock and bright splashes of colour provided by the silk cushions. There’s no immediately adjoining beach but the hotel has access to a private bit of sand just a five-minute buggy ride away. An outdoor heated pool is complemented by a sky pool set a few steps higher with a frothing Jacuzzi and open views all set within a vast fantasy stone sculpture. Last but not least, for meetings and small conferences, the grand ballroom can hold 350 persons theatre-style with a number of function rooms offering varying capacity. 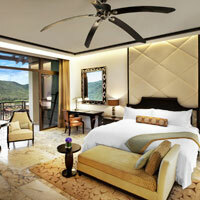 Opened in 2010, the Grand Metropark Resort Sanya offers 108 villas and 110 rooms. The resort is located just 20km from the airport, in the centre of the Yalong Bay International PGA Golf Course, offering tranquil views across the greens. Also find a British pub, spa and fitness centres, Kid’s Club and swimming pools. In-room Internet is complimentary and rooms are spacious. The resort is set some distance from the beach and transport and taxis can be problematic. The hotel shuttle drops visitors to the main road where they fend for themselves. Around 25 minutes from Yalong Bay, Dadonghai is a nightlife district with cafés, bars and, around a headland, watched over by Luhuitou Park (Deer Turning Back Park), further stretches of sand, though not as pristine as at Yalong Bay as much of the seafront is crumbling coral and rock. Expect a lot of artificial sanding and restrictions on swimming. A newer, or rather re-invigorated (read: rebranded), kid on the block is the Sanya Marriott Hotel Dadonghai Bay with two wings, one a new construct, with a fine view across the bay looking at lazily bobbing cruise boats, swaying palm trees, and sea-trippers. The newer wing features cream, curved ship-bridge style terraced lines running along a low rise. Expect high ceilings, lively piped music, and a strong focus on family holidays with kids and, of course, brisk Sanya conferences and meetings of all sizes and shapes. There's excellent Chinese food too as is to be expected at the group's signature Man Ho restaurant. The Marriott Executive Lounge serves up nice bay views with a terrace if you want to catch the breeze. A stone's throw away is the distinctive highrise sea-facing silhouette of The Shanhaitian Resort Sanya, Autograph Collection (opened March 2017), a hip and breezy lifestyle offering for the younger set with 199 rooms (starting at a spacious 62sq m) and 17 suites, all gussied up thematically. The hotel is well in tune with the pulse of the Dadonghai strip - known for its nightlife and fun - and sets a higher bar for the well heeled. This is not a beach hotel but one with big views. Think design flourishes and inspiration for its four room types drawn from well-known fashion brands. The experience starts with a friendly Skype hello in your limousine from the airport as you detail any particular stay preferences from room style to pillows for kids. Step in to be greeted by a projection wall, and sip a molecular cocktail while the kids savour homemade gelato. There’s a kids’ club to keep the young and restless entertained, while business travellers can enjoy the benefits of 800sq m of conferencing space for small corporate meetings or larger MICE events. This address brings families and corporates together in a lively meet-and-play environment. The recreation action is focused on the 3rd floor podium that brings together an infinity pool (with views), a pool bar, a gym with heated sauna, fitness centre, and wellness therapies for tired muscles at The Spa Collection. Banyan Tree Sanya Resort & Spa, at Luhuitou Bay, has 49 all-pool villas (more are in the pipeline) ranging from 45sq m to 85sq m. Floor to ceiling windows keep rooms bright, while bedroom décor retains a definite Chinese flourish. At this 30-acre tropical lagoon getaway expect a whizz mix of hydrotherapy and spa treatments, conference facilities, and villas offering private swimming pools, alfresco bathtubs, sun loungers, WiFi, flat screen plasma TV, DVD player, and pillow menu. The two-level Spa Pool Villa has a 55sq m pool, a private garden, open terrace and massage area. Yes, you’ll get an outdoor shower – or you can wait for the rains. The access road leads up a small rise to get you to the lobby overlooking the central "sunken" ornamental pool, and check-in is handled in a plush airconditioned area. None of that over-romanticised resort sea-breeze sweat and stagger here. Arrive in style and save the sweat for later for when you soak in the rays at your private pool villa. The beach is pleasant enough but requires a manual top-up of sand from time to time. The good news for cyber-hounds is that internet access is complimentary and WiFi is available free in all public areas. The villas look onto blue-tile pools (roll out of bed and wade in) and views of garden or sea. In-room find a handy and comfortingly old-fashioned Roman numeral clock, flatscreen TV, DVD player, a wooden work desk, and Chinese design touches. Pick a pillow to your liking. Expect a spacious bath area with twin vanities, walk-in closet, laptop-size safe, weighing scale, steam shower and an outdoor bathtub. Head upstairs for more open views and sun. 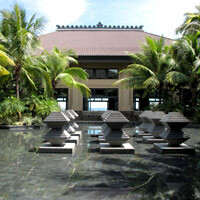 Of course, the main event here is perhaps the wellness menu at the Banyan Tree Spa Sanya. Try a 210-minute Royal Banyan treatment (rain mist steam, green tea scrub, herbal pouch and floral bath) or the Restored Vitality package. There's a lot to pick from in between including massages, scrubs and wraps. No question, this place positioned to be among the top Sanya luxury spa resorts. Taxis are not easy to come by here but, no doubt, you will be too busy gazing into someone's eyes. Despite the upscale thrust this is a very child-friendly Sanya resort with snaking water features and also doubles as a wedding venue. 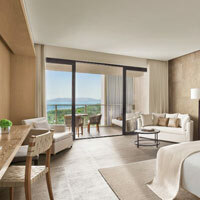 The Mandarin Oriental Sanya is a high-end retreat though it is far more understated in its expression. Unlike other more compact offerings, the 297-room low-rise Mandarin Oriental is stretched out in elegant grey stone over 12 slim hectares of quiet beachfront covering around 1.2km. That's a lot of walking. It offers perhaps the biggest Presidential Suite in Sanya at a staggering 3,328sq m, enough room for a parliament and a seat in the UN. Standard rooms are 60sq m with open sea views to capture lingering sunsets. Oceanfront villas come with a private garden, terrace, and a pool. The slate-roof Ocean View Pool Villas, up on the low hill offer woody interiors with ceiling fans, timber floors, some bed-area carpeting, large terrazzo tub, twin vanities, outdoor rain shower, inviting plunge pool set in a patch of green with captivating sea views from a belvedere, and large tactile in-room light switches that are a breeze to operate. The work areas have sockets in three styles to accommodate all but the most devious electric plugs and Wi-Fi is available at Rmb100 per day. Set out over two floors there are separate living and dining and areas with flat-screen TVs and DVD player. The hotel rooms offer a similar resorty feel. A 3,200sq m Spa Village with 18 treatment rooms is the highlight of the Spa at Mandarin Oriental, Sanya. 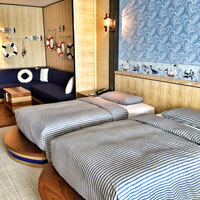 All the rooms serve up private steam showers and outdoor bathtubs with VIP suites tossing in a personal sauna as well. Do a simple massage or go for an all-day polish. The resort offers ample recreation options including yoga, tai chi, floodlit tennis, a fitness centre, three excellent swimming pools (one with a sunken bar) and, of course, long rejuvenating walks as you traverse the resort. The Luhuitou Golf Club is close by for swings on the greens. Try boating, fishing, or calorie-burning water sports. Despite its luxury positioning, the Mandarin is surprisingly child-friendly. Young married bankers with typhoon tykes in tow can breathe easy. The hotel has a MoMo Kids’ Club with complimentary ice-cream, a broad range of fun activities, water slides, and even a movie night for kids. Restaurants all feature children's menus. With a picture postcard on this scale, any toing and froing will need a buggy or strong legs. And close proximity to a protected coral reef and coral coastline means some compromise on the beach. A small area is cordoned off for swimming, of sorts. In the balance though this is a resort more for sunning than swimming. It offers a sense of away-from-it-all style and is very different in construct to the traditional Yalong Bay mega-building model. If you must walk the coral/pebble beach the hotel has thoughtfully provided protective rubber slip-ons. The grey slate stone used throughout is elegant and easy on the eye but some obstinate plaster drips in the joins lend some public areas the look of a lady hiding stretch marks. This does not detract from the overall appeal though. The Mandarin is serving up something very different, from its exclusive inventory of single-malt whiskies and the cigar divan to the Coral Bay Ballroom that can host up to 450 for a corporate meeting or conference. 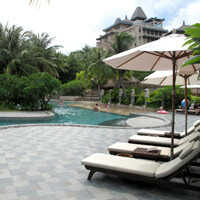 On this Sanya resorts review it is among the front runners despite the lack of swimmable beach. Service and style set a definite benchmark. At the 343-room InterContinental Sanya Resort sometimes referred to as "Sanya Resort, an InterContinental Hotel" (part of the huge, neat, green and swank apartment-leisure Serenity Coast development) there are breezy views across the bay. The eco-friendly modern property is just 15 minutes away from Sanya city in the Zhouji Lu area near Dadonghai. The grey building with lots of stone and wood texture fronts an artificial beach that is nonetheless pleasing to the eye with the signature Chinese restaurant at the end of the promenade, perched over the sea. A long and inviting blue-green pool runs along the boardwalk. This is a HUGE resort and staff use cycles to get around, especially if accessing the villas at the far end of the property. The villas have a separate drive in entrance for guests. This is also where the Club InterContinental lounge and facilities are located. The design is straight line with strips of grey stone stacked up neatly along walls and facade. Water features and pebble pools run through the complex. Zigzag along the plain white corridors to reach Club InterContinental with its own pool lined with large round blue cushions and sun umbrellas. A Club Sea View room is spacious with pale wood floors, beige rattan weave walls, deep green silk bed runners and tribal art decor with the local-lore "lu hui tou" deer interwoven into much of the design. Expect flat screen TV, iPod docks, Bose sound, a desk with data-port, free WiFi (charged cable internet), notebook-size safe, iron, hairdryer, twin vanities, a rain shower and a soaking tub. There is a day care service that provides a range of activities for children aged four to 12 and there are plenty of options to dine in style. 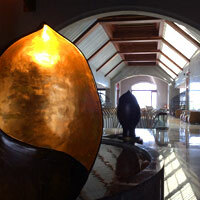 Or choose to kick back at the laid back Beach Bar with its hanging woven "bird's nest" chairs or the Hai Lounge. The InterCon has friendly vibes and a laid back feel. And Serenity Coast is a major plus for those looking for some apres-room action. 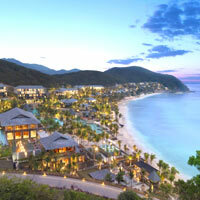 In the vicinity is the Anantara Sanya Resort & Spa (open June 2012) with 122 rooms and villas. This is a stylish two-part construct with a hotel wing and a secluded villa area. Expect good facilities for kids and families including a kids’ club, outdoor pool, tennis, spicy Thai cuisine and a refreshing signature Anantara Spa. In-villa enjoy outdoor soaking tubs, cool marble underfoot, bamboo roof above with lazy ceiling fans, rain showers and mod-cons like large flat-screen TVs and iPod docks. 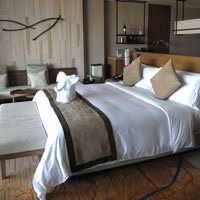 The faux-Euro Baohong Hotel Sanya is a decent choice for slimmer wallets not wishing to compromise too much on ambience. It has 460 rooms that are very spacious and comfortable, done up in a European or Asian style depending on which of the two towers you opt for. The finish is grand, marbled, and clean and will certainly appeal to Asian travellers. With the beach a short stroll away, in-hotel expect bathtubs, hairdryers, satellite TV, free high-speed Broadband, a laptop-size safe, a parking lot, gym, sauna and massage services. Another Dadonghai draw, this time for milling tour groups and sun-seeker Russians, is the large Sunshine Resort Intime. Sanya Bay is not a high-end holiday. This is a spot for budget hotels, family resorts, and value long-term deals. The bay front is tree lined and pleasant of an evening with glorious sunsets and iridescent skies. Condominiums and hotels line the boulevard where couples stroll arm in arm and hawkers sell everything from gewgaws to savouries. The pick of the bunch on Sanya Bay was easily the Narada Resort & Spa (at one time the Kempinski Resort & Spa Sanya but closed by end 2016). First opened in January 2007, the resort sprawled across 166 acres of prime beachfront at one secluded end of Sanya Bay West with a smorgasbord of accommodation choices from standard to spacious suites and Spa Villa Rooms. This was a chic and well thought out property with numerous engaging flourishes. For one it was a tad more compact than most megaresorts where it is a sweaty hike from room to café. The beach is far closer to the main building and is easily accessed without enforced dogleg meanders through gardens and walkways like the IKEA one-way see-all trek. 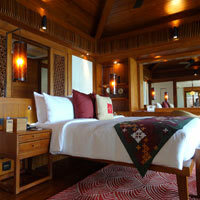 Elsewhere, the Narada Resort and Spa Perfume Bay (opened early 2011) boasts 96 individual villas and 96 rooms. Featuring traditional Han and Tang dynasty architecture, each villa comes with a private garden, two pools, and outdoor pavilion. Amenities in rooms include free Internet access and hi-def LCD TVs, while villas have WiFi and audio facilities from Apple. Check out the on-site spa, which offers a wide selection of treatments. You can personalise a wellness plan to suit your own needs. 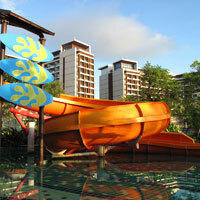 The Howard Johnson Resort Sanya Bay is a huge and grand twin-wing hotel overlooking a vast pool. Rooms are neat and modern without any surprises save for a mahjong table. Balconies offer sea views. In-room find Broadband access, an iron and ironing board, safe, satellite TV and phones with voice mail. The Grand Ballroom can comfortably manage 800 persons cocktail style and other distractions include the H-Spa, tennis, table tennis, children's club and fitness center. Of an evening sit at the edge of the lobby to take in the breeze, high above the resort pool and leafy grounds. Howard Johnson is set much farther west along the Sanya Bay strip. 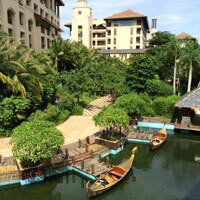 Also look out for the Holiday Inn Resort Sanya Bay. 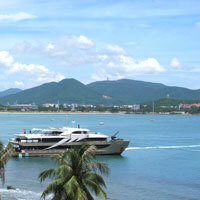 Sanya Bay and Sanya City is full of cheap hotels, many packed with Russian holidaymakers. Some popular inns for group traffic along the boulevard include Palm Beach Resort and Spa, a clean and competitively priced option, Pearl River Garden Hotel, the Tianfuyuan Resort, and the Sanya Shanhaitian Hotel. Up near the top of the fast developing Haitang Bay complex, around 28km north of Sanya City and 30 minutes from the airport on the new highway that tunnels through the rolling hills, is a new luxury playground for hipsters and romantics looking for a new groove, The Sanya EDITION (December 2016). On a sprawling 50-acre estate fronting emerald seas and a broad swathe of sand the hotel has been designed with several semi-private nooks and snuggeries for adults and lovers while ensuring bawdy kids can turn up the volume, safely sequestered elsewhere in the shallows. There are pools for grown-ups and pools for kids, saltwater lagoons and freshwater beachfronting pools with bars. The curving building houses 500 spacious rooms, all with an ocean view and 17 private villas with their own pools. Walk into the lobby - a cavernous minimalist slate-grey square box (with open front and back) - after pulling up under a towering slatted porte cochère that runs out high above and drops straight down at a right angle. Giant bamboo trees and foliage accentuate the vertical awe. Sea breezes whistle through the bare entrance, slapping you in the face with a salty welcome. You have arrived. Walk past water features to confront the main lagoon and the vistas beyond and swaying coconut trees as well as the 'embrace' of this modern construct with its two arms seemingly holding everything in place. Expect open-plan rooms with laundered white beds surrounded by pale wood hues and pastels, soaking tubs, large rectangular mirrors and textured walls. It is quiet, understated luxury in an elegant, faded, Gustav Klimt sort of way. As many as 55 percent of the rooms are in a twin bed format offerings greater flexibility for guests. 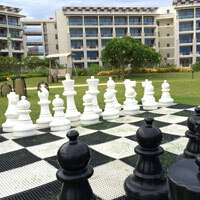 While the hotel aims to set new benchmarks for luxury lifestyle escapes in Sanya - as a fun and uncluttered adult playground for book lovers or honeymooners - it is also decidedly child-friendly despite clear intentions to mop up the MICE and conferences market with two ballrooms (1,300sq m and 456sq m) to manage any kind of meetings from small to big. Just down from EDITION is the emerging Indigo. This is also where you'll spot the humungous Atlantis Sanya (think huge dolphin show and aquarium as modest distraction) with its iconic sail 'fin' holding up the sprawling seafronting ensemble. When you're not gawping in the Aquaventure Waterpark or The Lost Chambers Aquarium you can return to your room to navigate 48-80sq m of luxe space (Ocean View Room with complimentary WiFi, and a bay-view balcony), up to 136sq m in a Deluxe Suite (with Club Lounge access), or splash out in a 146-173sq m Underwater Neptune Suite with lagoon views through full height windows, butlers, and a host of complimentary extras. The Atlantis is no slouch when it comes to corporate meetings or larger conferences with 5,000sq m of space for any imaginable rumpus or a delicate wedding ceremony watching fish glide by. Kids can swim with dolphins or sea lions at this child-friendly getaway once they're done with the adrenalin-pumping thrill rides. Glitzy designer brand shopping is coming up in The Avenues and fine to fun dining options await starting with the Gordon Ramsay Bread Street Kitchen & Bar. Then comes the Shangri-La’s Sanya Resort & Spa, Hainan (opened late October, 2014), which serves up a 45-acre playground with 340 rooms (there are eight villas too with butler service) and an arsenal of activities to keep all ages occupied. While this hotel is not quite what you might imagine a Shangri-La to be - it is somewhat laid back, frumpy and rustic, without Golden Circle amenities - it is a very child-friendly resort with a dedicated centrally-located Adventure Zone (expect the usual heart-racing slides) and a Kids' Water Park, two free-form pools, sandy playgrounds, trampolines, a bicycle trail, jogging, well stocked gym, volleyball and beach football. The Loo Hoo kids' club is a dedicated day care centre. To the right of the hotel's main entrance is another activity area with a rock climbing wall, ropes, and more for corporate team building exercises. The Adventure Zone is concealed within an artificial 'pink' rock garden with flowing water and waterfalls with the Dragonfly Bar sitting atop. With its flower arrangements and paths it is actually far more pleasant than the description appears. There's 300m of uncluttered beach too with an excellent vantage point to take in the views. The hotel caters for a broad mix of guests, from families to suits in search of a value meeting venue or incentive getaway (think 1,800sq m ballroom with six breakour rooms), and those hunting for a Sanya wedding resort option. 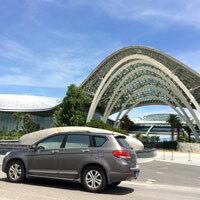 Shuttles run to the duty-free mall near the InterContinental and to Sanya town for more shopping and eats. Guests can also enjoy a 15-room Chi spa. In a 54sq m Deluxe room expect a private balcony, mountain or sea-facing, a generous 46-inch flat-screen LCD television, coffee and tea making facilities, complimentary WiFi and plug-in internet, and an iron and ironing board to keep the family tidy. In a 77sq m Family Sea View expect pale wood floors, wicker sofa, large flatscreen TV, laptop safe, woody tones, a tub with power shower and three three-pin international electric sockets set by the bed and table. Private villas up the rooming ante with a two-floor design, Bose sound, mahjong table, huge televisions, cream marble floors, exercise bike, bedroom balconies, rainshowers and a kitchen with your own personal chef. Just south of here on the fast-developing Haitang Bay strip are the closely nestled family-friendly Sheraton Sanya Haitang Bay Resort and an upscale and intimate Luxury Collection property from Starwood. The Royal Begonia Sanya opened mid-August 2012 with an upscale but broad-appeal inventory including kids’ club, water jet Jacuzzis, and a handful of discreet villas that open onto the beach. It utilises a simple hacienda design with cream stone, plenty of arches and red tile roofs reminiscent of Marbella. Watch for classy mosaic floor tiling in lifts and along corridors. The lobby is classic and intimate with plush furniture and sea breezes. Staff is attentive and brisk. A 70sq m Deluxe Ocean View is an old world retreat with plump white beds resting on rose blush carpets and pale wood floorboards. Think pastel candy stripes along the headboard, cream divans, small Euro lampshades, green celadon vases, and a dark-wood campsite davenport desk for a colonial thrill. Balconies are welcoming of light and air. In-room expect free WiFi, flat screen TV, fan, iPod dock, classic tea set, and a claw-foot bathtub behind a sliding door. There are twin vanities for him and her, a rain shower, and pale rust-burgundy walls in the bathroom. All in it is a pinky and feminine feel with solid finish for hesitant Alpha Male types. It is Parisian yet universal. A laptop-friendly safe is on hand for your prized Macbook, and an iron and ironing board for perma-creases on the go. Three villas open onto the beach. The two-bedroom unit has a large skylight set in the middle - serving as a courtyard almost - with the living space all around it. Expect a wraparound pool outside, a verandah, large tactile room switches, white decor with four-poster beds, and a blue tile bathroom with a welcoming rubber ducky. Later check out the Illy coffee machine. There is a TV den too with a rather large screen for hair-curling movie encounters or romantic snuggles. A central blue pool offsets the cream surrounds, punctuated by palm trees. Begonia is understated and charming with a nice grassy beachfront with swings for couples. A bit of a surprise then to encounter a large illuminated "Luxury Collection" sign set along the seafront to bedazzle passing ships. A stroll and a hop past the Asian beachfront restaurant InAzia takes you to the Sheraton Haitang Bay Resort, a curved construct with rooms facing the sea and a firm child-friendly disposition. The lobby is huge with a raised alfresco verandah facing the bay. The pool is set within the embrace of the residential wings at either side. Rooms are contemporary with pale wood accents and light-wood floors, all white, with daubs of blue and orange in the form of cushioned chairs and walls. WiFi will set you back Rmb80 per day (Link@Sheraton is a lobby solution) but you will likely be partaking of fresh air frolic, water sports, sunbathing, and other musclebound beach activity. Apres sweats check in to the spa for a wellness workout while the children scamper around the Kids' Club. Among the benefits of scale at this 500-room establishment is the ease with which a small corporate meeting (there are 10 function spaces, the largest at 1,500sq m) or a lavish wedding can be arranged. This is a hotel for a comfortable stretch for families and those wishing to unwind without fuss and butlers breathing down their necks. Moving south from here is the new Grand Hyatt Sanya Haitang Bay Resort (mid 2016), quite a mouthful, but a brisk-stepping and pleasant experience with lush foliage, pleasant walks, and a fabulous kids' zone for all ages (adults included). Three brown blocks encircle a large central garden dense with vegetation and echoing birdcalls with a large pond and long zig-zag wooden bridge thrown in to complete the idyll, on the banks of which sits the hotel's excellent fishing-village-theme Chinese restaurant. 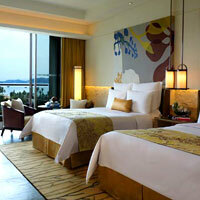 The 900sq m Camp Hyatt occupies pride of place as the centrepiece of any family-friendly Sanya holiday. It's a must-see. Expect a huge splash pool with slides, a huge bucket pouring water on all, spray hoses, a jungle camp, tree house, jungle gym, indoor rumpus rooms, full fledged kitchen for cooking classes, koi fish pond and climbing wall. There are table games and more, all served up in airconditioned splendour. There are 435 rooms and eight spa villas. Deep carpet corridors lead to light wood doors behind which families may find a nautical theme with connecting entrances. There's 68sq m of stretch space, with cream floors, pale stressed wood walls, navy blue tones and stripes, a laptop safe, dehumidifier, square soaking tub with window, rain shower and amenities for kids. Traditional minority Li designs are evident in the lattice work everywhere. An Ocean View Club has dark wood floors, pale wooden wall panels, twin vanities, a verandah with a divan or daybed, a large flatscreen TV and one three-pin multiplug socket at either side of the bed. Also find a coffee machine and a walk-in dresser with iron and ironing board and laptop safe. The rooms at Hyatt are on the plain side and do not stand out when compared with the competition but they are supremely functional and well designed. Free WiFi is a plus. For Sanya conferences and corporate meetings, or even a glitzy destination wedding, there's a 900sq m Grand Ballroom with a 460sq m foyer as well as a residential style meeting courtyard with seven salons for the pin-stripe set. Later wander into the greenhouse style cafe set below the lobby or peer into the show kitchen at The Pool Grill. Just down from here the large unmistakeable contours of the leaf-shaped Mangrove Tree Haitang Bay (late 2017) are emerging rapidly. 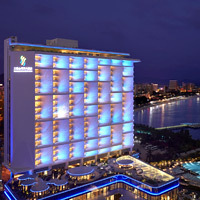 The stately Conrad Sanya Haitang Bay launched in 2011 and is sited next to this. This low-rise property in cream stone is quietly contemporary with symmetrical lines and geometrical shapes that are soothing to the eye. From the breezy lobby, look out over long rectangular black tile pools, cobalt-blue ceramic pots, green hedgerows, fountains and paved walkways to an oceanfront pool, a large grassy lawn with daybeds and swings – perfect for a Sanya resort wedding splash – and a very good beach. The understatement is delightful even if the occasional faux-Roman flourish distracts the eye, like the black metal statues of cupids and angels adorning the fountains all sporting bright gold hair. A zen black-tile pool just below the lobby ringed by Chinese zodiac animals is a playful counterpoint. This Conrad is for lovers, honeymooners, newlyweds and, yes, even families and those in search of small corporate meetings in Sanya. It is a versatile address and manages it all with aplomb. Service is exceptional, the concierge remarkably good and brisk. A 55sq m Garden View Plunge Pool room is classical in style and simple in execution with a flat-screen TV, pale-yellow marble floors, a stuffed fabric panda to greet you on the bed, a plunge pool and WiFi at Rmb80 per day. The work desk has a data-port with two three-pin electric sockets (there is also a socket on either side of the large bed), and a sliding frosted glass door leads to the dressing and bathing areas. In-room are iron and ironing board, a flat laptop-friendly safe, twin vanities, a bathtub for long soaks, and a Nespresso machine for wake-me-up coffee shots. The spa will pamper and cajole tired city slickers to within an inch of perfection. Pick quick massages or go for full-day body treatments in one of four spa villas. This is a large hotel so look forward to energising walks. The less athletically inclined can call in for an electric buggy. All in this is a standout address that succeeds in part because it tries less hard than some of its Yalong Bay peers. That quiet charm and lack of Disney mayhem explains why this is among the best Sanya resorts on Hainan with multipurpose flair. Keep an eye on the Haitang strip. Some fancy names are arriving or in the pipeline. 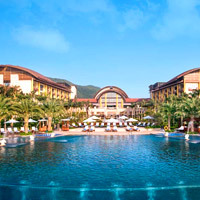 Adjoining sister property DoubleTree Resort by Hilton Hotel Sanya Haitang Bay is a mouthful in any language and is graciously geared towards families with a raft of child-friendly options along with vast conferencing space for pin-striper dads intent on CEO networking. The hotel serves up 1,290sq m of versatile function space for small corporate meetings to larger events. The hotel-style development fronts landscaped gardens with large water features – including a 2,400sq m swimming pool – and a broad swathe of good sand. Expect a spa, kids’ pools, lagoons to explore, a fitness centre and, in-room, high speed internet and large 42-inch flat-screen TVs for work or play. The Haitang Bay Golf Club is close at hand as well. Moving southwards, a stately and swank surprise with great service and attitude to match is the neat and stylish Sofitel Sanya Leeman Resort that despite the weighty double-barrelled name is easily among the best Sanya luxury resorts around. The high ceiling lobby is welcoming of light and breeze and from the lounge with its blazing red anthuriums and perhaps mariachi singers of an evening, the resort curves around the bay in three blocks - Gold, Jade and Pearl. One of the first things you'll notice here is how interactive and attentive staff are. Whereas at some hotels staff will shrink at the sound of a foreign voice, here people step up to engage you in conversation in a sociable and pleasant manner. Converse in English, French, Putugongua... It puts this hotel a cut above. Of the 477 rooms, the majority are ocean facing and with balconies to watch some amazing sunrises. A 65sq m Ocean View room offers a marble foyer, light wood parquet inside, pale green fabric walls and a signature anthurium (in season) on the round wooden table. Next to the table are media ports and two three-pin multi-plug sockets. There is also one three pin multiplug socket at either side of the plump bed framed by just a grey-weave headboard and accompanied by two elegant vases with cream lampshades. It faces a large slim television that belts out Sofitel's unique brand of chillout music. It is catchy and can get into your head. A gauzy translucent sliding glass door - that may prove problematic for convention twin-shares - leads to the washroom with large mirror framed by lights, twin vanities, Lanvin toiletries, cosmetic mirror, soaking tub, hair dryer and cream marble floors. WiFi is free and the digital clock by the bed is easy to use. The room tones are pale woody with turqyuoise and green accents. The safe is laptop-friendly and an iron is available to wrinkle out stubborn creases. The 360-degree view Crystal Room for weddings and events is set in a cool reflective pond overlooking the generous lawns rolling on to the beach and sea, the kids' pool and rumpus area. The large freeform pool is below (there are three pools including one with heating). The kids' area includes splash slides, the de rigueur giant bucket that pours gallons of water on unsuspecting dawdlers, a pirate ship and lots of space for exercise. The pool is open 8am to 7pm. There is an indoor area too for toddlers and younger guests with table tennis and activities like archery while the more intrepid can sample horse riding on the beach (about Rmb200 for 20 minutes) or a helicoptor tour (Rmb900 per passenger with a minimum two to book). Paths along the long manicured greens resound with chill-out music or cool guitar strains in the morning hours emanating from tiny but powerful 'rock' speakers hidden in the foliage. A stunning and long two-tier pool awaits by the beach, ideal for sun lovers or those wishing to swim laps without bumping into heads. As would be expected at this French chain, the food is excellent, be it the buffets at Cuisine, the Szechuan morsels at Hainan Pearl or the lavish breakfasts with everything from Japanese noodles and fresh breads to sausages, juicy bacon, Chinese vegetables, and even savoury eggs Benedict by the yard. The Sofitel consistently serves up the best food on the island, hands down. Sofitel Sanya Leeman compares well vs neighbours Conrad and Royal Begonia. It is a stylish address with snappy service on rails, great F&B, and works well for both small corporate meetings and glitzy conferences as well as romantic Sanya beach weddings with enough grass for that tropical feel underfoot. Unlike say the Grand Hyatt, which has dense and lush foliage (albeit very attractive in an Indiana Jones kind of way), Sofitel is minimalist and uncluttered with a clear line of vision. It is appealing and neat and enables the carving out of a great deal of space for romance and more. Right next door to Sofitel, the Rosewood Sanya (opened August 2017) serves up 229 rooms in the first 14 floors of what is billed as the tallest building in Hainan at 46 cloud-scraping storeys. Adjoining this is the spacious and unmistakeable gold Sanya Forum (International Finance Forum convention centre) with event space and a ballroom to be managed by Rosewood. While attached to a tower, the Rosewood is not itself a spindly tower hotel, and its broad contours run in smooth extended curves holding up the reflective-glass tower that looms dramatically at the rear. There is ample stretch room then - rooms are from 65sq m, all ocean fronting. There are 61 residential villas too in the the manicured estate that spreads over 16 hectares. Enjoy five restaurants and a lounge, a Sense spa, a kids' club, and a mammoth 2,800sq m of meeting space. Rosewood is setting itself up as both a sybaritic getaway for luxury trippers (45 rooms have a private balcony with plunge pool) as well as a Sanya conference hotels pick with contemporary and versatile MICE facilities. And having a relatively compact footprint means things can be managed efficiently. It's a short stroll to the beach or, if not salt water inclined, you might head up to a 103m sky pool and gawp at the views. The Wanda Vista Resort Sanya (formerly the Kempinski Hotel Haitang Bay Sanya (opened July 2012) is a sprawling establishment where good walking shoes will come in handy. For the more romantic, there's a 1.2km snaking sea-water canal replete with dragon boat gondolas to glide you effortlessly through the complex though the sun might rake your back midday. The brand change has not been without its bumps and the jury is out on service and standards. With 4,000sq m of lawn for weddings and events, an open-air play area for kids, an activity-packed Kids' Club, and a huge swathe of beach, any wonder the place is potentially one of the best family-friendly Sanya resorts around and a Haitang Bay muscle contender for corporate meetings and MICE. Simply say "cheese". Click (WiFi is free), Work (plug points are UK-style three-pin as well as crow's feet Chinese style), or Eat (enjoy some of the best breakfasts on the island, 15 private dining rooms and a range of cuisine including the excellent Chinese Yuen Court). This massive and breezy 576-room complex is set in six separate but connected beige-stone buildings blending modern comforts with Chinese classical (don't miss the 200-year-old pagoda in the grounds). The ornate carved wood dome of the high-ceiling main lobby is a case in point as are the birdcage seats. Indeed carved wood is the dominant leitmotif at this resort. And there's plenty of it, from the massive reception wall carving to the intricate bas-relief on the room desks, and the solid wooden cabinets that close with a satisfying thunk. Nothing flimsy about any of it. Spacious 65sq m rooms (rooftop Duplex Suites weigh in at 118sq m), serve up dark woody interiors, minty scents, large flat-screen televisions, top-loading laptop safes, charging points either side of the bed, pipe reading lights, heavy drapes, silk bed runners, and decent balconies with a boldly placed round bathtub for the intrepid. The open plan bathroom extends behind the bed with twin vanities, rain shower and flip-out mirrors that will delight or frazzle depending on your point of view. We'd prefer the regular rooms as the Duplex Suites involve a three-flight 33-step climb up from the living room to the bedroom. This means it is hard to fully enjoy all your space. You do get two fabulous balconies, one with a four-seater table, and one with a round outdoor tub. The living room desk comes with a three-pin multi-plug and the bathroom, sensibly, has separate toggles for the rain shower and the hand shower. Villas run from 211sq m in various configurations with two, four and five-bedroom layouts. In a larger establishment enjoy 567sq m of stretch space all set up in mandarin style with straight-back rosewood emperor chairs, blue gauze curtains, aquamarine cushions, dark-wood furniture in angular lines, and marble floors. Living and dining is downstairs with bedrooms upstairs. Look forward to spoiling saunas, large soaking tubs, rain showers, Jacuzzi, stone patio, verandah, and swimming pool. This is a broad stroked place for a range of needs and whims that caters for suits as well as leisure trippers and especially families with teeming kids in tow. There's space for all stripes. The spa has a range of treatments. The seaside wedding chapel "Aura" was knocked down by the government as it was too close to the beach but in its place come fresh manicured lawns. The helipad is close by in case you need to marry in a hurry or can't afford the Rmb300,000 package for a ceremony and villa stay. Look forward to a Paulaner Brahaus for microbrewery lager as well and gawp at two ancient pagodas. Add to this access to any number of golf courses and, for history buffs, a slate-tile Art Museum. That's quite a mix. Have one too many, say "I do" and then live happily ever after with the kids. Kempinski was earlier marked down as a Sanya conference hotel that worked well for resort weddings too and we shall have to see whether it can maintain its game as under Wanda. In the far south of the Haitang Bay development along a quieter stretch about 10 minutes from Wanda Vista (formerly Kempinski) and next to a major military hospital - that is gaining popularity for medical tourism - is the huge Haitang Bay Gloria Sanya. This is the group's island flagship and clearly they have pulled out all the stops to achieve a grand welcome for travellers. The large airy lobby looks over gardens and a huge freeform swimming pool. The resort fronts the sea and the river and is constructed in a contemporary pagoda style with dark wood, black marble and clean zen-like water features everywhere. The villas to one side are privately owned and managed. The hotel itself offers 449 rooms with free WiFi in public areas and internet cables in-room. An interesting feature is that rooms have piped natural spring water to help with therapeutic remedies should you be so inclined. A 95sq m Grand Seaview Suite is a modern construct with rich wood floors, dark wood panels along the walls, cream carpets, grey-gold sofas, a large balcony and generous flat-screen TV (both in the living room as well as in the bedroom). Expect a signature towel swan on your bed, iPod dock, big light switches and, in the bathroom, a rain shower, twin vanities, LCD set in the mirror, a dressing room, make-up mirror and a flat laptop safe. The resort offers 7,000sq m of function space outdoors with oceanfront venues and 4,600sq m indoors. Golf is another attraction, within easy reach. Expect lots of material and texture at this modern and friendly resort. Jumping now to the far north of the Haitang Bay strip, about a 12-minute drive along new roads with street lights powered by solar energy and wind power, is The Westin Sanya Haitang Bay Resort (opened late 2013). At first glance, this is a futuristic space-age construct with a curving bird's-nest facade, lit up at night and enlivened by a steel "waterfall" that cascades over the porte co-chere while ripple-wood cutouts run along public-area ceilings to provide a sense of the elements. That said, the emphasis is on simple clean design that borders on the plain. And this is what is endearing about this resort set, as it is, amidst a nouveau riche cacophony and the sort of design on steroids that would have Michael Jackson leaping from his grave. The Westin's high ceiling lobby is empty save for a central slab of rock, with the reception area set discretely to one side. The sea breezes whistle through unobstructed, past the sunken timber deck sofas. There are 448 rooms girdling the building and accessed by open-sided corridors that firmly put you in touch with the "elements". The rooms are mischievous and chic and will appeal hugely to a younger set and the hip and restless. The main design feature is the open plan bathroom that greets you as soon as you step in, with the soaking tub in plain view of both the incoming guests and whoever is in the room. Fear not, a sliding door can swiftly separate the bedroom. What this construct has done is open up the space vastly making the bathing area large and inviting with its rough hewn grey stone floor. A 65sq m Grand Seaview Room serves up this eyebrow-raising foyer-bathroom entrance with its signature egg-shaped tub. Expect a separate rain-shower (in a private frosted-glass cubicle), a single washbasin, weigh scales, a laptop-friendly safe, iron, and a quick switch to the bedroom with its wooden floor, misty cobalt blue carpet under the bed, round divan, balcony, large flat-screen television, WiFi (free for SPG members but otherwise charged) and a three-pin multi-plug socket on either side of the pillows. The small circular desk is all glass and is set next to a data-port with two more three-pin sockets. 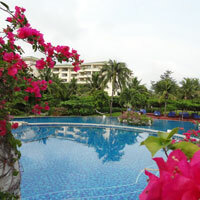 Westin also manages 14 villas set in and around 17,000sq m of water features. As the first Westin beach resort in China, the spotlight is on service and experience. Expect a Westin Spa, three restaurants, a strong leisure focus on "renewal" and healthy dining (think therapeutic white tea), yoga, jogging circuits and more. The Seasonal Tastes all-day menu restaurant features a "Sandwiches & Burgers" section with no burgers but this is a minor niggle that will be fleshed out as the resort gets into stride. Corporate meetings are a snap here with space for various combinations utilising the 1,200sq m ballroom and 10 function spaces. The Run Westin programme offers a three kilometre route with map. And energy saving programmes throughout ensure the focus stays green. Family-friendly features include a Kids' Club - the Discovery Room from 9am to 6pm for children up to 12 years old - and big spenders can stroll across to the duty-free mall with some of the best prices north and south of the Yangtze. The enormous low-slung futuristic glinting steel building alongside is the new Haitang Bay International Shopping Complex (operated by China Duty Free Group, August 2014) that has become a focal attraction not just for Haitang Bay but the entire South and Southeast of the island. It is one of the biggest in the business so should you have a craving for designer brand fashions or cool cafes, head here. A caveat for would-be buyers, the prices are expensive and you'll do better in Hong Kong, Singapore, UK or even USA. But stuff is cheaper than at local Chinese department stores and malls and the place pulls in the Asian crowds. Across the road is an Art Museum. Be aware that taxi drivers may ask for usurious sums on the way out, having conveniently forgotten about their meters. For those with cash to splash there is the Sanya Duty-Free Shop too closer to Sanya City. Immediately north of the vast duty free mall is the distinctive curved ship-bridge highrise of the 291-room InterContinental Sanya Haitang Bay Resort. This is another vast high ceiling lobby with an array of wood sculptures and artefacts including a giant teakwood table. Walk straight through to a sheesha bar and alfresco lounge with a range of chairs, sofas and comfy jump-ins. This belvedere looks over the two pools and water feature and gardens that head towards the (somewhat) distant seafront. The plot is longish and involves a fair walk (or a buggy ride) to get to the superb beachfront with its pool bar that does white-linen under-the-stars dinners on verdant lawns to the accompaniment of a live band. The hotel has a brisk vibe and is busy. The design that is supposed to mimic a dragon encircling itself is more hotel than resort, with a space-age conference centre alongside the lobby entrance. This is a muscle MICE hotel for conventions with the space to funnel people around quickly. The hotel operates a few seafront villas (with the rest privately managed by the owner). 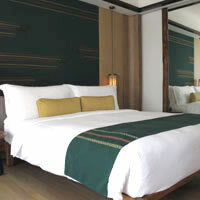 The 88sq m rooms are pleasantly woody with a lot of texture and a central bed around which the entire room is set. Walk out to a breezy balcony with a soaking tub and wood slats for partial privacy - and the company of a cheerful rubber duck. In-room as you step in expect marble floors with an open plan bathroom to one side and work area on the other with two three-pin multi-plug sockets. The rough hewn wood finish is attractive, as are the dresser table with small oval vanity mirror and the angled chest-of-drawers upon which is poised a large flatscreen TV. The effect is homey. The bathroom features twin vanities and rainshower. The bed is set smack in the middle of the room on a tan carpet with an olive runner. The headboard is effectively the room separator between bathing and sleeping areas. There's a laptop safe and iron. 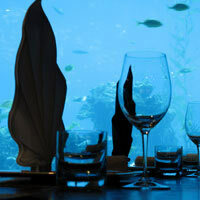 A wonderful asset is the basement Aqua restaurant that is open for dinners only. It runs along the length of a vast glass-walled aquarium stocked with all manner of fish. The decor is dark and muted with small glowing lamps at each table. There is a also a submerged glass walkway leading out and up to the gardens. After work, exercise at the fitness centre or head to the I Spa for a massage or exotic rubdown. The beach is excellent but can be too rough for swimming in certain months. And kids will enjoy Planet Trekkers from 9am to 9pm with its 300sq m play space, video games, and various activities. You may even get in a free bike ride but for general rental an adult two-seater is a pricey Rmb80 per hour with a kids' bicycle at Rmb50. For fun there's a three-seater cycle too. Driving up the coast towards Clearwater Bay you'll hit Tufu Bay and the upcoming W Retreat Sanya (2019) and the Renaissance Sanya Resort & Spa. The sprawling Renaisance, with its lagoon pool, kids' club, splash slides, Quan Spa and meetings space for up to 900, is addressed Haitang Bay but it is actually along the curve of Tufu Bay farther north. As with the other mega-resorts along the strip it is billed as a Sanya weddings resort and a relaxed spot for family holidays. If you're one for eating, there are seven restaurants to pig out at. Also at the Tufu Resort Area, Yingzhou Town, Lingshui, about a 15 minute drive north from Haitang Bay, is the luxe Capella Sanya (late 2018) with 190 keys including a stylish hotel 'manor' and six villas. Think upscale tea room, futuristic spa with Moroccan hammam and other spoilng amenities. North of Haitang Bay about 20-30 minutes by taxi from Haitang Bay along the eastern coastline via some new highways is Clearwater Bay, a green and neatly laid out development with a huge golf course and several residential villas and highrise apartments. This is the area earmarked for further development as the concrete and pile drivers migrate north. Clearwater Bay is far more developed as a residential area than Haitang Bay and also runs deeper inland away from the coast. It is a 30-to-40-minute run to the airport from here at around Rmb250 in a taxi. In the pipeline here are a Jumeirah, JW Marriott, Holiday Inn and a Hilton. The sprawling but unassuming Raffles Hainan (opened September 2013 in Clearwater Bay, 20 minutes away) is at first glance immediately a cut above the rest with its understated clean lines and Balinese touches including a stone gate "candi bentar" with waterfall at the porte co-chere. Pass through the grey stone entrance to an air-conditioned timber-floor lobby with crimson bursts of anthurium looking over serene black stone pools. The hotel wings arc out either side of the uncluttered Clearwater Bay Lounge (with its dark wood furniture and tapestry) enfolding a grand lawn in between. 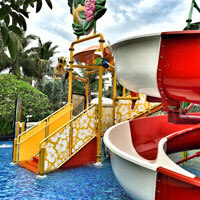 Beyond that are two swimming areas - a winding lagoon pool to enthrall kids and a lap pool for serious calorie burning. The hotel serves up a smorgasbord of 200 rooms, 99 suites and 32 villas spread out across a well manicured estate with two championship golf courses next door. Expect breezy, open sea views, and rooms starting at 80sq m with enough space to swing an elephant by the tail. Best not to, though. It would seriously tarnish the impeccable decor - in a woody Balinese setting, with long private balconies - running the length of the living room and bedroom in suites - complimentary WiFi, flat-screen TVs with DVD players and iPod docks for the well-heeled and restless. Think large goose down beds and extensive pillow menus for weary heads after the beach walks, swims, jogging, cycling, and wellness workouts at the 1,400sq m Raffles Spa (with its 12 treatment villas). A 170sq m Grand Ocean View Suite up the ante dramatically with a kitchenette and family mod-cons like a microwave and larger fridge. Expect a generous living room with an enormous balcony featuring a four-seater table, sofas, and sun loungers. Much as elsewhere at the resort, the layout is square, simple, and in clean straight lines. Decor is predominantly earthy, tan, brown and rust. The timber is cool underfoot while a carpet under the bed keeps feet snug. Also find a classic round dial clock, three-pin multi-plug electric sockets on either side of the bed, a spacious work desk with data-port, large flat-screen TVs, tactile switches for in-room gadgetry, and a peek-in glass panel separating the bathtub from the bed. Blinds whoosh down at the press of a button. The bathroom is large and marbled, with a walk-in dresser with dressing table, twin vanities (using raised ceramic bowls), iron, ironing board, a laptop-friendly safe, yoga mat, and an electronic Japanese toilet seat. Some suites like the Presidential offer the added bonus of private meeting space for a corporate chinwag and a gym. The Raffles butlers are at your beck and call and, at the Villas bag a private garden with pool and easy access to the golf course. No less than seven restaurants and bars ensure guests are well replenished on calories and coolers and the menus include Chinese at Bai Wei and Italian at Sapori. The gardens are ideal for events but for those popping the BIG question, there's a scrubbed white chapel by the sea for an idyllic Sanya beach wedding. 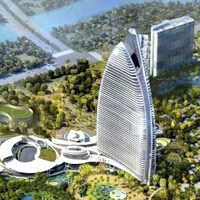 If you are comparing apples with apples look at Raffles Hainan vs Conrad Haitang Bay as both offer a sense of space and style that is somewhat comparable with Conrad presenting a more lowrise construct. Up in the Perfume Bay just north of Clearwater Bay along the same eastern coastline, the mysterious Alila Xiangshui Wan was shaping up as a spread out retreat, with acres of low-rise indulgence in villas and hotel rooms designed with Shang dynasty touches. By the end 2016 it had dropped off the Alila menu. 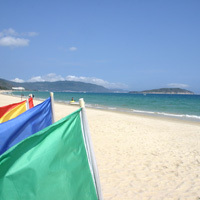 Shimei Bay is on the east coast of Hainan Island and is about 90km from Sanya heading north to Haikou. 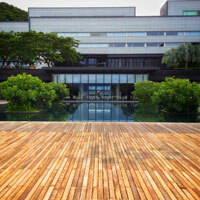 One of the first to open here is Le Meridien Shimei Bay Beach Resort & Spa. Set over 11 hectares, on an attractive stretch of beach, Le Meridien has 275 spacious rooms and suites, including 25 villas. 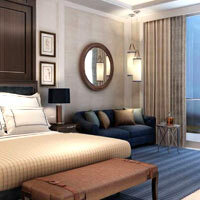 Expect hi-tech features (DVD players, 37-inch flatscreen TVs, wired and Wireless Internet) and warm décor. There are indoor and outdoor pools (children get their own pool as well as the Penguin Kids Club), a spa, several restaurants and bars, a sea sports centre, and a wide variety of meeting and banquet facilities. Bikes are available for rent, and four golf courses sit within easy reach. Haikou, the capital of Hainan, is a small and bustling business city in the north of the island about a two to three-hour drive from Sanya on the new expressway. Haikou literally means “Mouth of the Sea” and its boulevards and parks are lined with coconut trees. 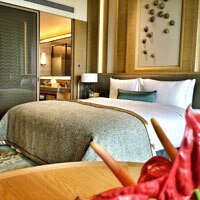 Haikou business hotels abound and Haikou conference hotels and leisure options are endless. However, this is not a place to tarry in unless you are there on work in which case you’ll find the facilities ample and comfortable. Of course you might try local delicacies like “Wengchang chicken” and “Hele crab” or venture out to Holiday Beach or Wugong Temple before racing south to Sanya. Shaking up things here is The Ritz-Carlton Haikou (2017), a Hainan luxury golf resort with 175 rooms, 16 lavish suites and 16 villas. It caters for big swingers interested in the 10 golf courses next door in the Mission Hills enclave, and over 37,000sq ft of meetings space is on hand for classy corporate meetings from small to big or Muscle MICE events. Rooms offer sweeping views of the championship course while a pampering spa is on hand to soothe stressed muscles - and nerves - with top ESPA products. The building is a striking mid-rise with reflective glass and two cream stone design supports. High-ceiling rooms are sedate with dark wood panels, light pastels and deep blue carpets. The Mission Hills Hotel – Hainan (www.missionhillschina.com), is a 525-room hotel, a top choice among Hainan golf resorts, with a wellness spa, a lazy river tube run and a well equipped kids' club. Expect free internet. This is a good Haikou family-friendly hotel choice and if you are a golf enthusiast the 10 lush and challenging courses will keep you fully occupied and entertained. 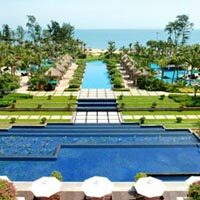 Or you might do the 40-minute drive from Meilan International Airport and stay at the swish Sheraton Haikou Resort that occupies a prime stretch of beachfront not far west of Haikou City. The 341-room hotel offers the customary Sheraton Sweet Sleeper Bed, balconies, in-room safe, oversize bathtubs, WiFi in public areas and high speed Internet in the rooms. Also find rainforest showers, iron and ironing board and a wide range of satellite channels. This is a good Haikou conference hotels pick with 1,300sq m of meeting space including a sans-pillar ballroom. Another Haikou five-star hotel is the Hainan Junhua Haiyi Hotel (formerly Meritus Mandarin Haikou) in the heart of the financial district. The hotel has 318 rooms and conference facilities with a 756sq m pillar-less ballroom that can host 500. Guestrooms are neat and old fashioned in light pastels if a tad plain and unadormed but the location is fine. The Presidential Suite and the Junhua Suite are the ones to go for if the wallet stretches. Facilities are modern, from the audiovisual equipment to the simultaneous translation service. Among the better Hainan conference hotels, the Junhua also offers extensive fitness facilities including tennis. The amazing Crown Spa Resort Hainan is a 20-minute drive from downtown Haikou, on the beach. The place is a hallucinogenic Las-Vegas-Meets-Paris affair. Modelled along the design of a classical French chateau, the hotel consists of three buildings, one housing the extensive and well equipped Crown Lotus Spa that claims to have the largest hydrotherapy indoor hot spring. The 333 rooms are grand with all mod-cons. No stinting on the goodies here. Guests like the place, kids have a great time, and if you need a Hainan conference hotel with a difference, this could be it. Baohua Harbour View Hotel is a huge high-rise complex directly across from the green expanse of Wanlu Park with good views of the Strait. The smallish rooms, 418 of them, are clean and comfortable. There is a shopping arcade below and a selection of restaurants. Generous rate discounts tend to be the norm here. The 196-room Haikou Hotel in the centre of town describes itself as the “White House of Green Ireland”. Whatever that might mean, it provides an excellent and cheap, if somewhat ageing, base for exploring Haikou on foot, with easy strolls to nearby East Lake and People’s Park. Boao Scenic Zone, on the east coast of Hainan, just below Haikou, is at the confluence of two rivers (on the estuary of the Wanqing River) and the resulting sandbanks lend the place its special charm. 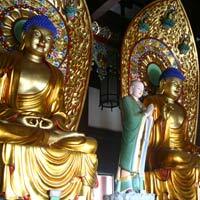 It is about 160km from Sanya and a two-hour drive. Haikou is just 30 minutes away. This is where the Boao Forum for Asia took its name. Despite that, the forum is moving south to Yalong Bay’s beckoning beaches. The Hainan Boao BFA Hotel (formerly Sofitel Boao) is a pleasant option in this area, located on Dongyu Island and fronting the beach. You’ll find 437 rooms, ample restaurants, a spa, hot springs, tennis, a Graham Marsh designed golf course and the BFA Convention Center that can host up to 2,000 persons. Post Sofitel, standards are a tad frayed but the hotel is fine for meetings groups. And that’s the A-to-Z of this Sanya guide to resorts, spas, hot spring getaways, luxury resorts, Hainan conference hotels and the best Sanya beaches. Exchange rate: The Chinese currency is the renminbi (literally “people’s currency”, US$1 = Rmb6.87). Banks, money changers and ATMs are available in the arrival halls of both Sanya Airport and Haikou Airport. Hotels are happy to change US dollars and foreign currency (at their own conversion rate) and major credit cards are accepted. Travel season: The rainy season with the odd typhoon blowing in from the South China Sea runs May-October. Winters are pleasant to cool at night. Useful information is available from Hainan Tourism at en.visithainan.gov.cn or China International Travel Service (CITS – www.cits.net) and China Travel Service (CTS – www.chinatravelservice.com) who can assist with hotel booking, air tickets and transport. They offer a range of package tours too. Any hotel prices wherever listed here are the best available internet rates (BAR) for reference only. Expect to add on tax and service charge. Rates will fluctuate depending on whether it is peak season or off. Sanya low season rates will range from Rmb570 at a modest Sanya Bay property and Rmb1,200 at a quality Yalong Bay five-star to Rmb2,500 at a luxury establishment and about Rmb3,500 for high end villas in Haitang Bay..
Golden Coast Hot Spring Hotel. Tel: [86-898] 6277-8888, fax: 6277-8899, (e-mail: boaogolden@boao-golden.com.cn or www.boao-golden.com.cn). Hainan Boao BFA Hotel (formely Sofitel Boao). Tel: [86-898] 6296-6888. Anantara Sanya Resort & Spa. Tel: [86-898] 8888-5088, fax: 8888-5288, (e-mail: sanya@anantara.com or sanya.anantara.com). Banyan Tree Sanya. Tel: [86-898] 8860-9988, fax: 8860-1188, (e-mail: sanya@banyatree.com or www.banyantree.com). Baohong Hotel Sanya. Tel: [86-898] 8855-8899, fax: 8855-8833, (baohonghotel.com). InterContinental Sanya Resort. Tel: [86-898] 8861-8888, fax: [86-898] 8861-7666, (www.intercontinental.com/sanya). Mandarin Oriental Sanya. 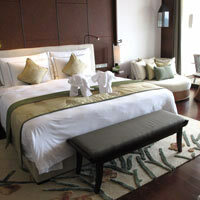 Tel: [86-898] 8820-9999, fax: 8820-9393, (e-mail: mosan-reservations@mohg.com or www.mandarinoriental.com/sanya). 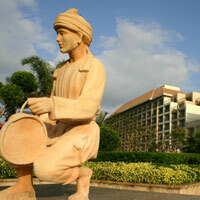 Sanya Marriott Hotel Dadonghai Bay. Tel: [86-898] 8821-1688, fax: 8821-1988, (www.marriott.com). Sunshine Resort Intime. Tel: [86-898] 8821-0888, fax: 8821-1088, (www.resortintime.com). The Shanhaitian Resort Sanya, Autograph Collection. Tel: [86-898] 8828-5688, fax: 8825-5688, (www.marriott.com). Baohua Harbour View Hotel. Tel: [86-898] 6853-6699, fax: 6853-5358, (e-mail: sales@hibaohuahotel.com or www.hibaohuahotel.com). Crown Spa Resort Hainan. Tel: [86-898] 6596-6888, fax: 6596-0456, (e-mail: reservations@csrhn.com or www.csrhn.com). Hainan Junhua Haiyi Hotel (former Meritus Mandarin Haikou). Tel: [86-898] 6854-8888, fax: 6854-0453, (e-mail: resvn.haikou@haiyi-hotel.com or www.haiyihotel-group.com). Mission Hills Hotel – Hainan. Tel: [86-898] 6868-3888, (www.missionhillschina.com). Sheraton Haikou Resort. Tel: [86-898] 6870-8888, fax: 6870-6999, (e-mail: Sheraton.haikou@sheraton.com or www.starwoodhotels.com/sheraton/). The Ritz-Carlton Haikou. Tel: [86-898] 3288-3020, (www.ritzcarlton.com/en/hotels/china/haikou). Atlantis Sanya. Tel: [86-898] 8898-6666, (e-mail: info@atlantissanya.com or www.atlantissanya.com/). Conrad Sanya Haitang Bay. Tel: [86-898] 8820-8888, (e-mail: HaitangBay.sales@hilton.com or conradhotels.hilton.com). 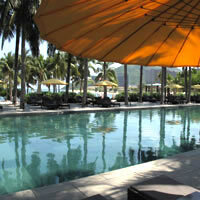 DoubleTree Resort by Hilton Hotel Sanya Haitang Bay. Tel: [86-898] 8882-6666, (doubletree.hilton.com). 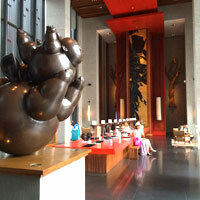 Grand Hyatt Sanya Haitang Bay Resort. 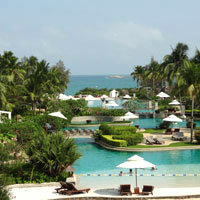 Tel: [86-898] 8881-1234, fax: 8871-1234, (sanya.grand.hyatt.com). InterContinental Sanya Haitang Bay Resort. Tel: [86-898] 8865-8888, (e-mail: reservation@ichaitangbay.com or www.ihg.com/intercontinental/). Le Méridien Shimei Bay Beach Resort & Spa. 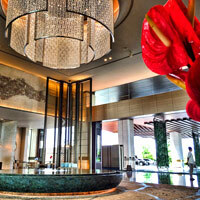 Tel: [86-898] 6252-8888, fax: 6252-8827, (e-mail: lemeridien.shimeibay@lemeridien.com or www.starwoodhotels.com). Renaissance Sanya Resort & Spa. Tel: [86-898] 3885-8888, fax: 3821-8088, (www.marriott.com). Raffles Hainan. Tel: [86-898] 8338-9888, (e-mail: hainan@raffles.com or www.raffles.com/hainan/). Shangri-La's Sanya Resort & Spa, Hainan. 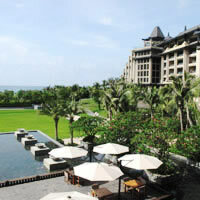 Tel: [86-898] 8875-8888, (www.shangri-la.com/sanya/shangrilasanya/). Sheraton Sanya Haitang Bay Resort. Tel: [86-898] 3885-1111, fax: 3885-2222, (e-mail: sheraton.sanyahaitangbay@sheraton.com or www.starwoodhotels.com/sheraton/). Sofitel Sanya Leeman Resort. Tel: [86-898] 3299-8888, (e-mail: or www.sofitel.com). The Sanya EDITION. Tel: [86-898] 8835-9999, (www.editionhotels.com/sanya). 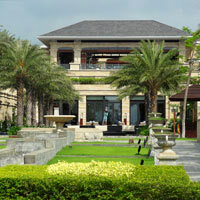 The Royal Begonia Sanya (a Luxury Collection resort). Tel: [86-898] 3885-9999, fax: 3885-7777, (e-mail: luxurycollection.royalbegonia@luxurycollection.com or www.starwoodhotels.com/luxury). Wanda Vista Resort Sanya (formerly Kempinski Hotel Haitang Bay Sanya). Tel: [86-898] 8865-5555, fax: 8859-4936, (www.wandahotels.com/index). The Westin Sanya Haitang Bay Resort. Tel: [86-898] 8865-9999, (e-mail: Westin.Sanyahaitangbay@westin.com or www.starwoodhotels.com/westin/). Sanya Pearl River Nantian Hotspring Resort. Tel: [86-898] 8881-9888, fax: 8881-9292, (www.nantianwenquan.com/). Holiday Inn Sanya Bay. 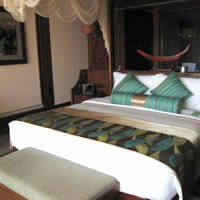 Tel: [86-898] 8833-9988, (e-mail: hotel@hi-sanyabay.com or www.ichotelsgroup.com). Howard Johnson Resort Sanya Bay. Tel: [ 86-898] 3888-8888, fax: 3886-8888, (e-mail: reservations.resortsanya@hojochina.com or www.hojochina.com). Narada Resort & Spa (formerly Kempinski and closed late 2016). Tel: [86-898] 3889-8888, fax: 3889-7777, (www.naradasanya.com). Narada Resort and Spa Perfume Bay. Tel: [86-898] 8330-8888, fax: 8330-0666, (e-mail: resv@naradavilla.com or www.naradavilla.com). Palm Beach Resort and Spa. Tel: [86-898] 8833-1888, fax: 8833-0001, (e-mail: vacation@pbresortspa.com or www.pbresortspa.com). Pearl River Garden Hotel. Tel: [86-898] 8821-1888, fax: 8821-2955, (www.pearlrivergardenhotel.com/). Tianfuyuan Resort. Tel: [86-898] 8833-3888, fax: 8833-9358, (e-mail: welcome@tianfuyuan.com or www.tianfuyuan.com). Aegean Conifer Suites Resort Sanya. Tel: [86-898] 8898-8898, fax: 8856-9008, (e-mail: Sales@iaegean.com or www.iaegean.com). Cactus Resort Sanya. 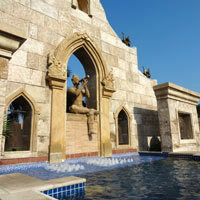 Tel: [86-898] 8856-8866, fax: 8856-8867, (e-mail: info.crsyha@gloriahotels.com or http://sanya-resort-cactus.gloriahotels.com/). Huayu Resort and Spa (formerly Crowne Plaza Sanya). Tel: [86-898] 8855-5888, fax: 8855-5999, (e-mail: reservation@huayusanya.com or www.huayuresortyalongbay.com/). Grand Metropark Resort Sanya. Tel: [86-898] 8859-8888, fax: [86-898] 8855-8588, (e-mail: sygm@metroparkhotels.com or www.metroparkhotels.com). Hilton Sanya Resort and Spa. Tel: [86-898] 8858-8888, fax: 8858-8588, (e-mail: sanya@hilton.com or www.sanya.hilton.com). Holiday Inn Resort Sanya Yalong Bay. Tel: [86-898] 8856-5666, fax: 8856-5688, (e-mail: sales@holidayinnsanya-yalongbay.com or www.ihg.com/holidayinnresorts/). Horizon Resort & Spa. Tel: [86-898] 8856-7888, fax: 8856-7890, (www.horizonsanya.com). MGM Grand Sanya. Tel: [86-898] 8869-1999, fax: 8865-5999, (e-mail: reservations@mgmgrandsanya.com or www.mgmgrandsanya.com). Park Hyatt Sanya, Sunny Bay Resort. 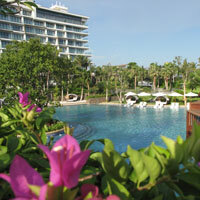 Tel: [86-898] 8820-1234, (e-mail: sanya.park@hyatt.com or sanya.park.hyatt.com). Pullman Sanya Yalong Bay. Tel: [86-898] 8855-5588, fax: 8858-5121, (e-mail: h6467-re1@accor.com or www.pullmanhotels.com). Resort Golden Palm. Tel: [86-898] 8856-9988, fax: 8856-9999, (e-mail: welcome@resortgp.com or www.resortgp.com). Rosewood Sanya. Tel: [86-898] 8871-6666, (www.rosewoodhotels.com/en/sanya). Sanya Marriott Yalong Bay Resort & Spa. Tel: [86-898] 8856-8888, fax: 8856-7111, (www.marriott.com/syxmc). Sheraton Sanya Resort. 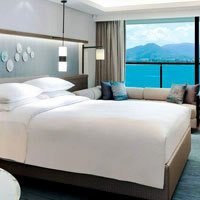 Tel [86-898] 8855-8855, fax: 8855-8866, (e-mail: sanya.sheraton@sheraton.com or www.sheraton.com/sanya). The Ritz-Carlton Sanya. Tel: [86-898] 8898-8888, fax: 8858-6888, (e-mail: rcsy.reservation@ritzcarlton.com or www.ritzcarlton.com). The St Regis Sanya Yalong Bay Resort. Tel: [86-898] 8855-5555, (e-mail: reservations.sanya@stregis.com or www.stregis.com/sanyayalongbay). Yalong Bay Mangrove Tree Resort. Tel: [86-898] 8855-8888, fax: 8855-8800, (e-mail: sales@mangrovetreeresort.com or www.mangrovetreeresort.com).